There is no better way to see the Sedona area than in a back country Jeep tour! 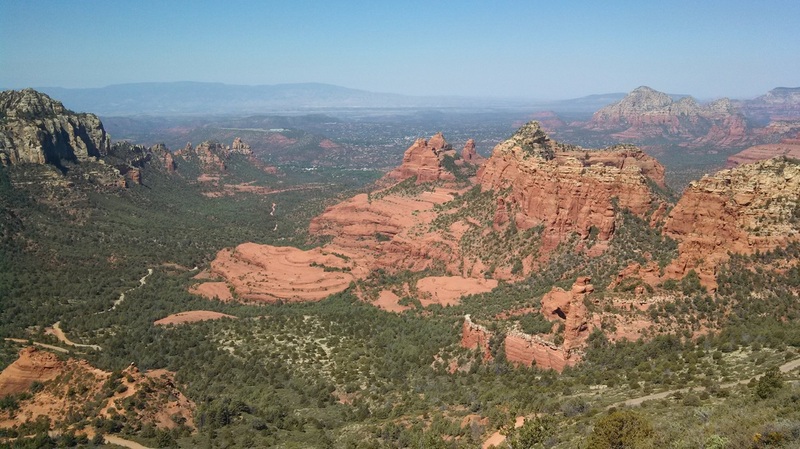 These photos are from the several tours and trails of Safari Jeep Tours in Sedona, Arizona. For more info, contact Safari at 928-282-3012 or at safarijeeptours.com. Tell them Randy sent you! 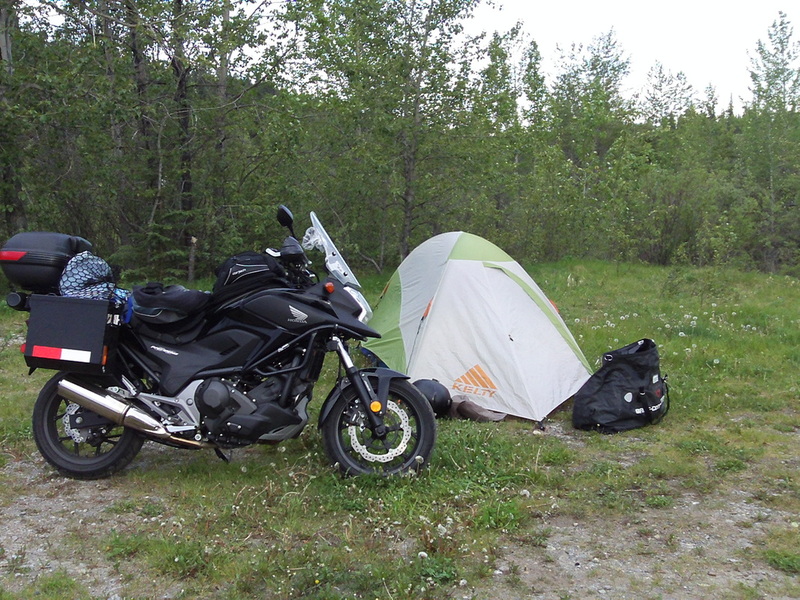 My Alaska motorcycle trip actually began in 2015 after riding the Utah Backcountry Discovery Route. 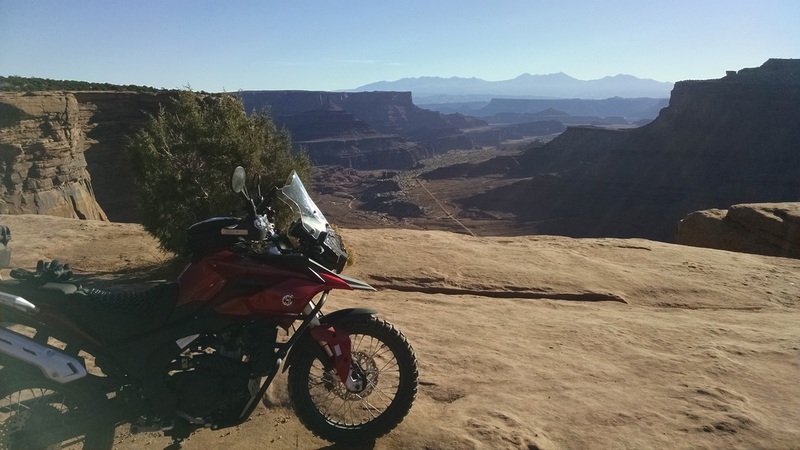 I had previously ridden dual-sport motorcycles on the Trans-America Trail, mostly on unpaved roads, from Tennessee to Arkansas in 2013 and then from Arkansas to Utah in 2015. 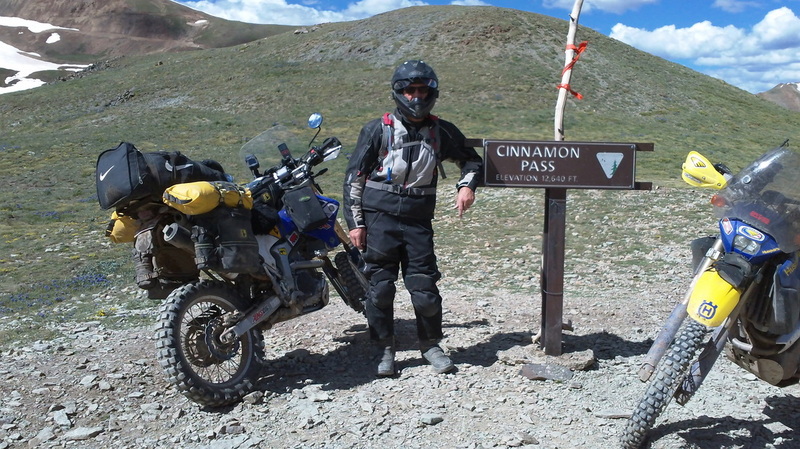 I had also ridden over the mountain passes on sections of the Colorado Backcountry Discovery Route and the grueling Arizona Backcountry Discovery Route. 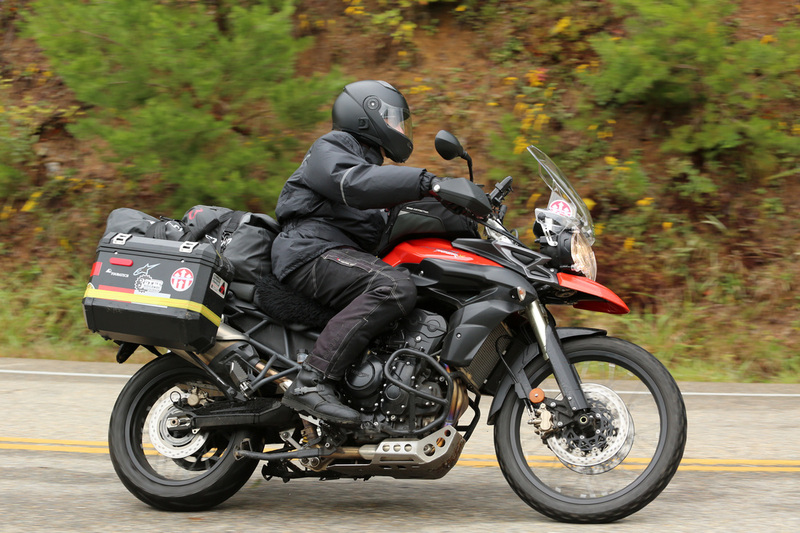 Plus, I had taken a road trip on my last bike, a Triumph Tiger 800XC to Asheville, NC and then down to Key West, Florida. Before one trip ends the planning begins for the next adventure. Alaska had been on my “bucket list” for many years. Would the calendar allow an extended trip in 2016? My first preparation would be building the perfect “adventure” motorcycle. 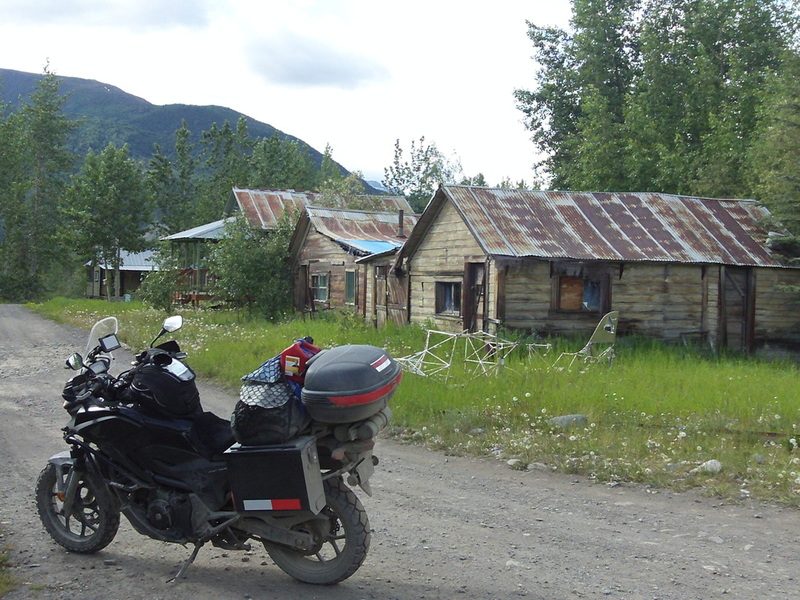 If I was going to ride to Alaska, I wanted to include many miles of unpaved roads to some of the remote locations that I had read about. That meant a mid-weight bike with good fuel economy. I am not a fan of the monster 1000cc and 1200cc bikes that weigh over 800 pounds. I was going to be making a solo ride so I needed a bike I could pick up by myself! 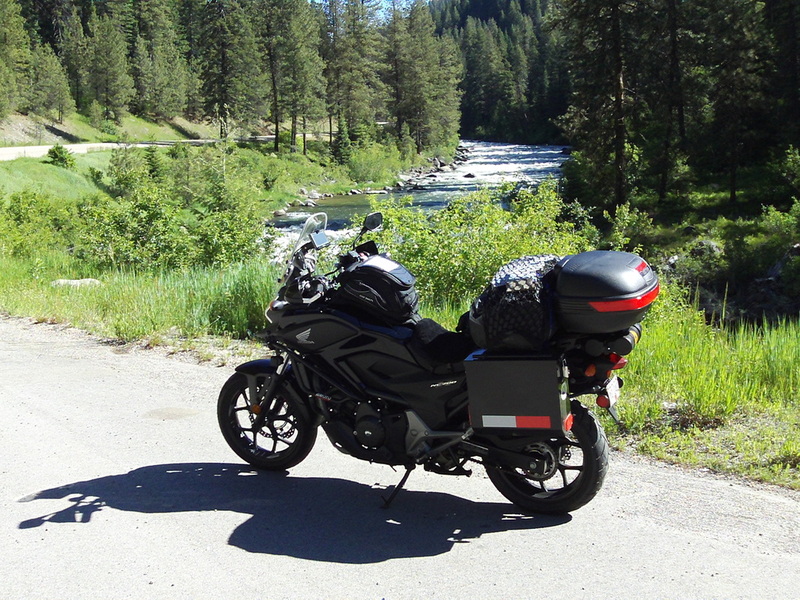 But the trip to Alaska and back includes several thousand miles of paved roads so the bike also had to be powerful and comfortable for long, long days on the highway. After much comparison shopping, I decided on the Honda NC700XD. Like all adventure motorcycles, this bike was a compromise. At 670cc it was on the low end of the “adventure” category. But this smaller engine also delivered outstanding fuel economy over 60mpg! Instead of the tall 21-inch motocross front wheel I had on my previous Triumph and Yamaha, the Honda had 17-inch wheels front and rear. The larger front tire is a big advantage in rough terrain, but I only wanted a bike for riding gravel and dirt roads, not motocross off-roading. Plus, unlike most dirt bikes, the Honda had tubeless tires that allowed for faster fixes of simple punctures without even removing the wheels from the bike. I also opted for the DCT model, or Dual Clutch Transmission version of the NC700. This new transmission uses two clutch plates to instantly engage the correct gear at the exact rpm. No rev and pause and shift like a conventional clutch, or even an electric shift. The shifting is precise and smooth and perfectly efficient. With the DCT, Honda is simply providing what 98% of auto and truck owners consider standard: an automatic transmission. SW Motech quick-release pannier brackets. To these I bolted a set of Tusk small aluminum panniers. The low exhaust placed the panniers close to the bike for minimal wind resistance. Blue Sea accessory fuse block for the driving lights, heated grips, Garmin Nuvi GPS, a 12-volt outlet, and 2 SAE outlets for a battery tender and for my heated 12-volt vest. I also added two carriers under the rear box to carry MSR fuel bottles. The 500ml fuel bottles served as fuel for my Coleman camp stove and emergency fuel for the bike. I carried my sleeping bag, tent, sleeping pad and a compact cot in the waterproof duffel that I secured across the pillion seat and the tops of the pannier boxes. On top of the duffel I had a camelback water container in a cargo net that also provided a convenient place to stash my jacket as the day warmed up. In every other respect, the Honda was stock - no modifications to the engine or exhaust. 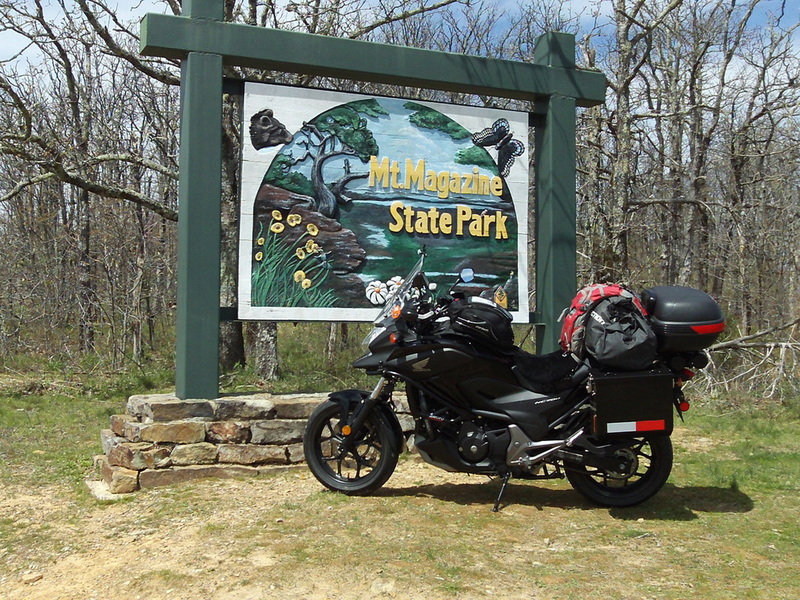 n April, I loaded up the bike and took off on a three-day, 750-mile ride around NW Arkansas. Everything worked perfectly. After a little reorganization of the packing list and some fine-tuning of the load distribution, I was ready for Alaska! I began my 2016 Alaska adventure on June 1st. 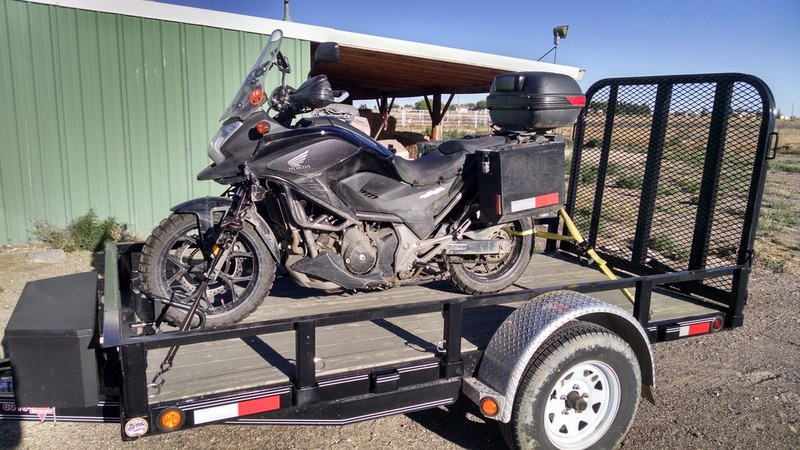 For the first two days I trailered my Honda NC700XD to my Cousin’s home in Mountain Home, Idaho from Arkansas. This cut off 1,725 miles coming and going from Idaho, and at least 6 days of riding across the hot and windy plains of the U.S.
On June 4th, I left Mt. Home and rode west to Boise and then turned north up the panhandle of Idaho, crossing the border into British Columbia at Eastport. I found a spot to camp for the night. Total distance was 559 miles on Day 1. 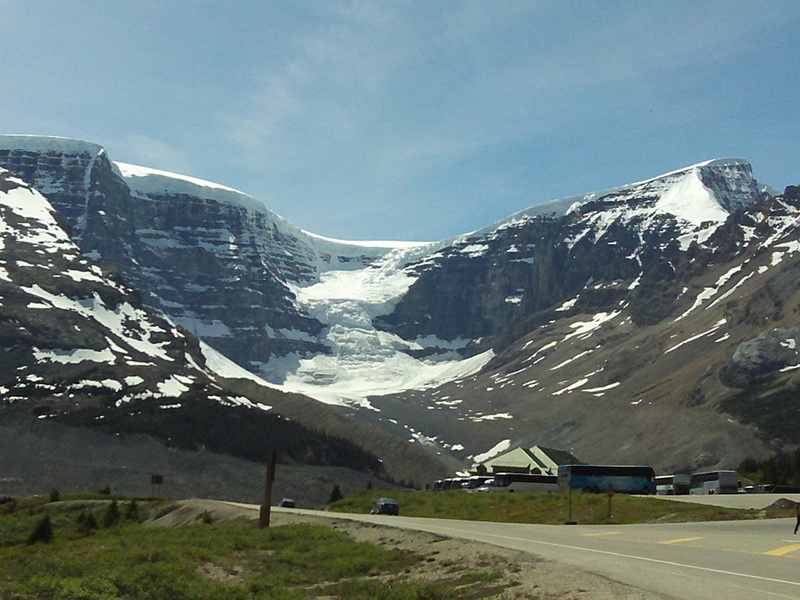 Day 2 began with a ride up Hwy 95 in BC to Kootenay National Park, and then NW along the Ice Fields Parkway in Alberta past Lake Louise to Jasper. You could have stopped every mile for a photo. The mountains rose on all sides. 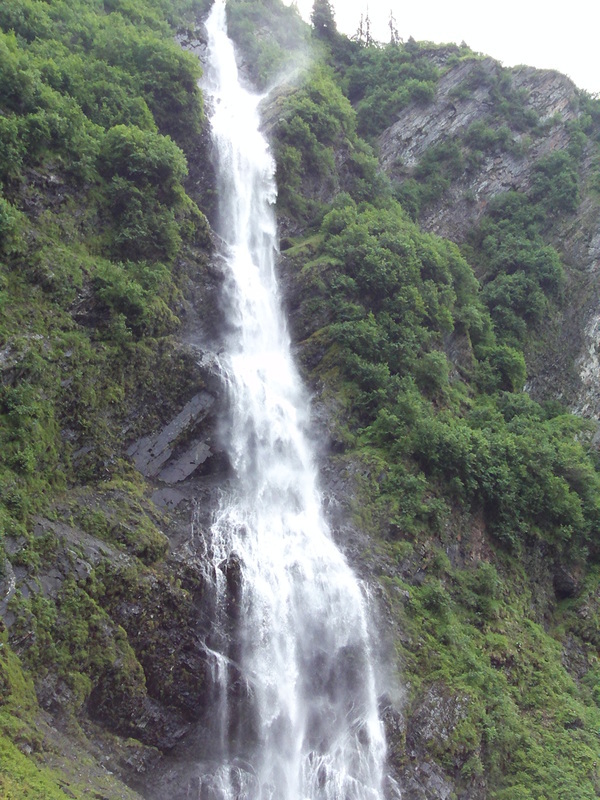 Glaciers hung in the valleys, waterfalls plunged from the cliffs. And there were sheep, deer, bear, and elk visible from the road. Riding alone, I couldn’t stop and tour the many sights that required parking and walking. I stopped, took a few photos and moved on. 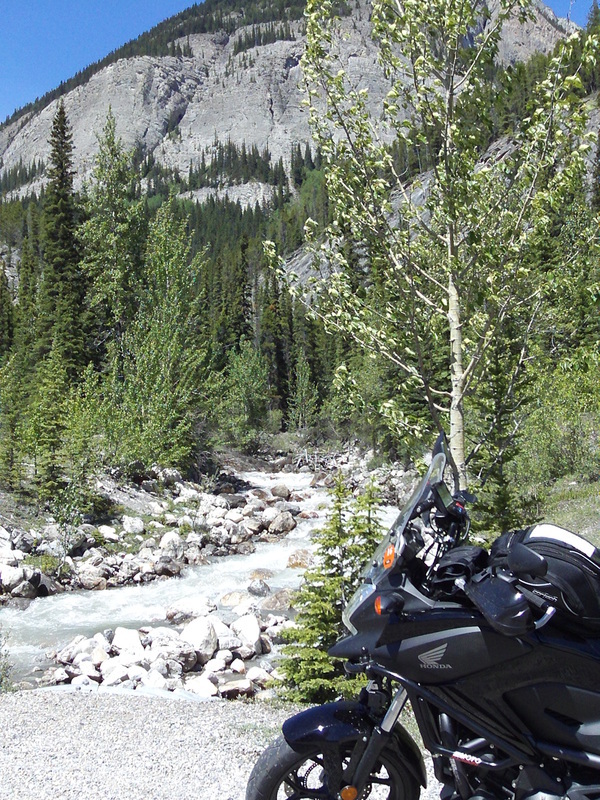 After supper in Jasper, I headed NE toward Hinton, then NW toward Grand Cache for a campsite. I rode 510 miles on Day 2. 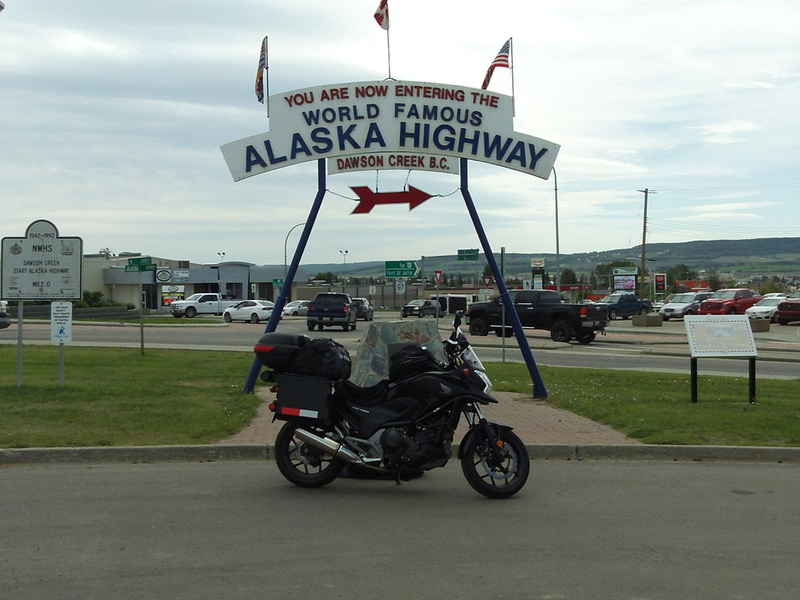 Day 3 the route continued into Grand Prairie, Alberta and then west on Hwy 43 to Dawson Creek, BC - the official start of the Alaska Highway. The countryside in central BC reminded me a lot of northern Wisconsin where I lived for many years. The difference was instead of whitetail deer there were now mule deer, grizzly bears and even a dead moose along the road. 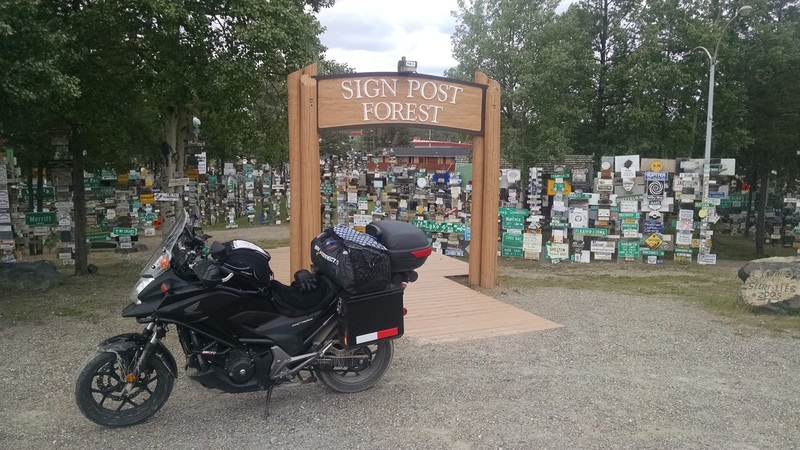 After lunch I continued NW on Hwy 97 and finished the day in Fort Nelson, BC. Black clouds followed me into town and I quickly found a motel for a shower and some laundry. This was a total of 502 miles on Day 3. Day 4 continued west to Toad River for fuel. I had a comfortable range of 200 miles on the 3.7 gallon tank. But often the fuel stops were about 150 miles apart meaning that couldn’t skip a stop and make it 300 miles before refueling. That was OK; I needed an excuse to stop and stretch every few hours anyway. Most of the rural gas “stations” were simply one fuel pump. There were no convenience stores outside of the larger towns. 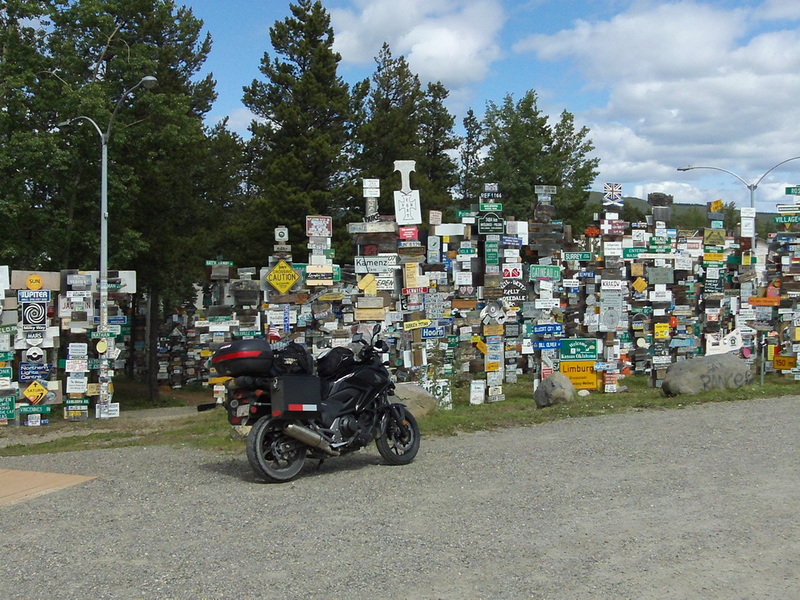 The highway continued to Watson Lake and the famous "Signpost Forest". This is a collection of thousands of street signs and city signs from around the world. The display originated with the construction crews who were building the Alaska Highway and has continued to grow ever since. 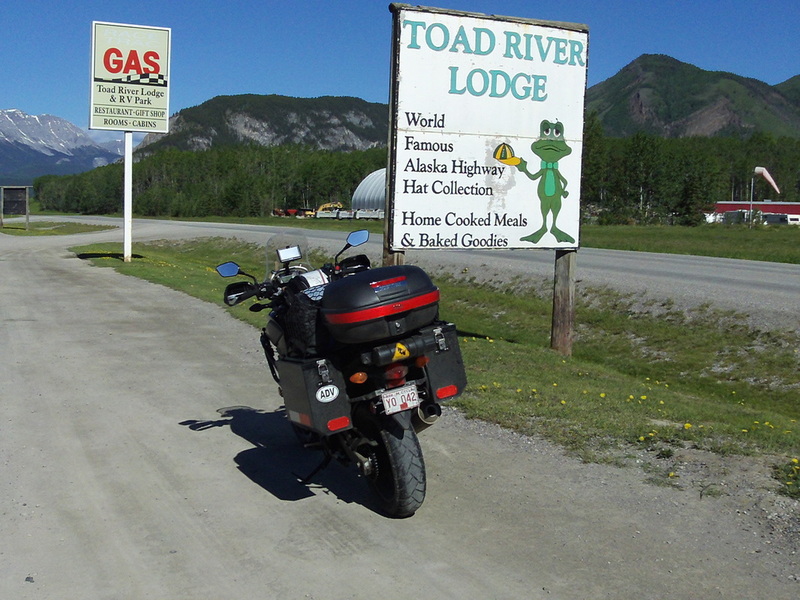 After refueling again, I rode on Hwy 1 to Teslin for a campsite on Day 4. 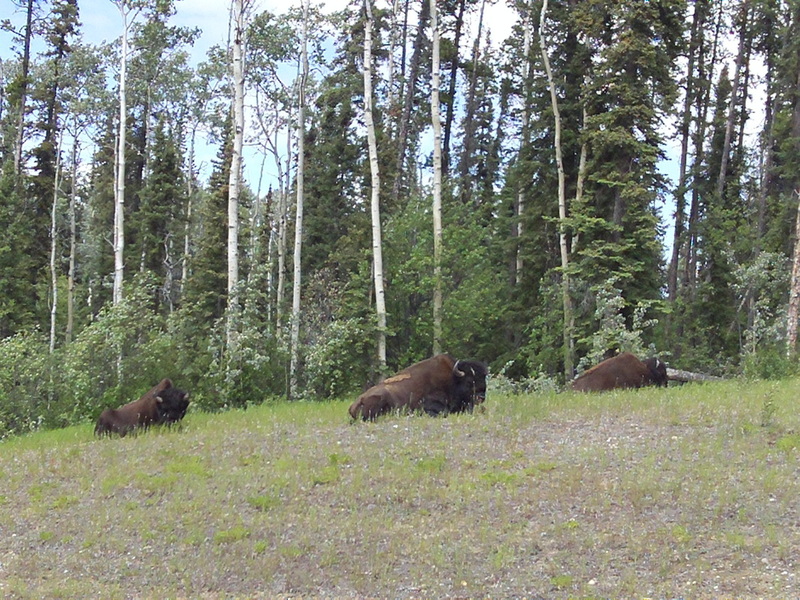 It was on this last leg that crossed back over the BC border that I saw 8 bison right on the mowed shoulder of the Alaska Highway. I had also seen 5 black bears during the day. A total of 492 miles on Day 4. 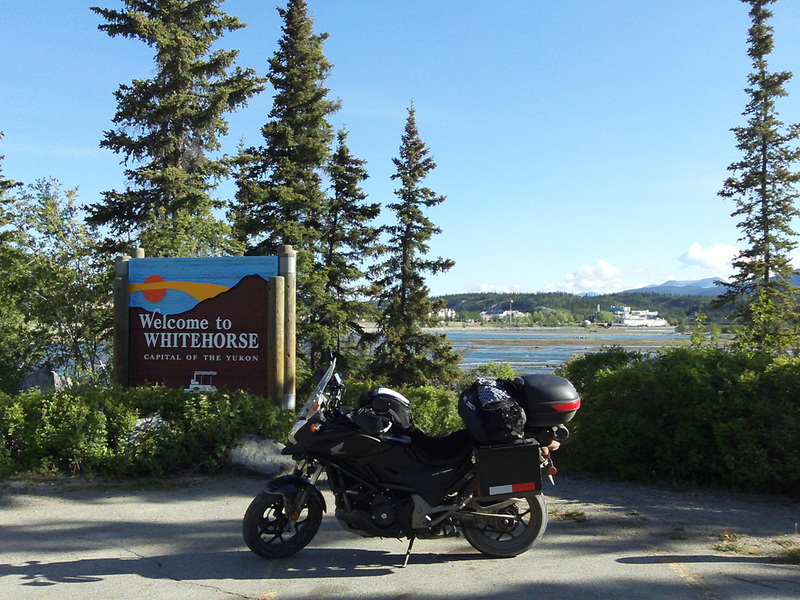 Day 5 started out nice with a fast ride into Whitehorse, Yukon. After coffee and a doughnut at Tim Horton's and fuel for the Honda, I continued west on the long route towards Alaska. The afternoon weather turned nasty - cold, rainy, and very windy. It was a long cold slog against a tiring cross wind in a driving rain to Destruction Bay. 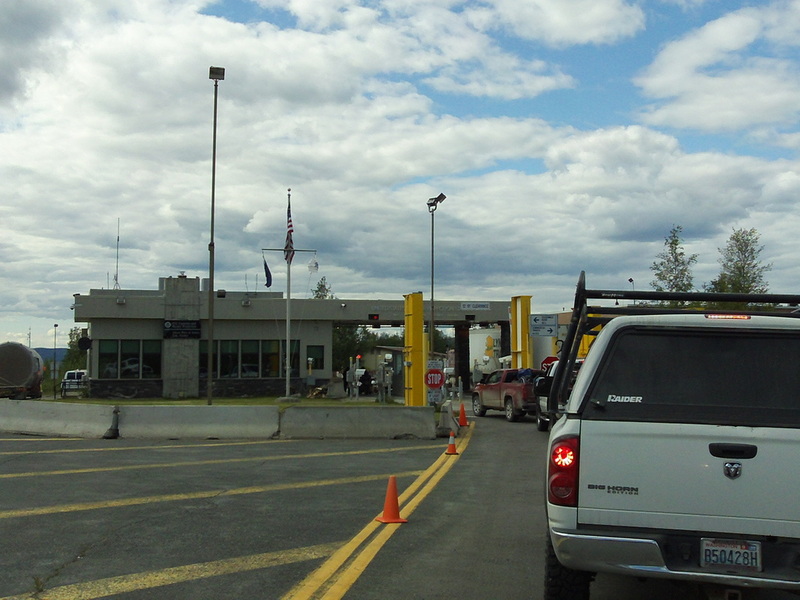 Another 136 miles brought me to the US border and crossing into Alaska. 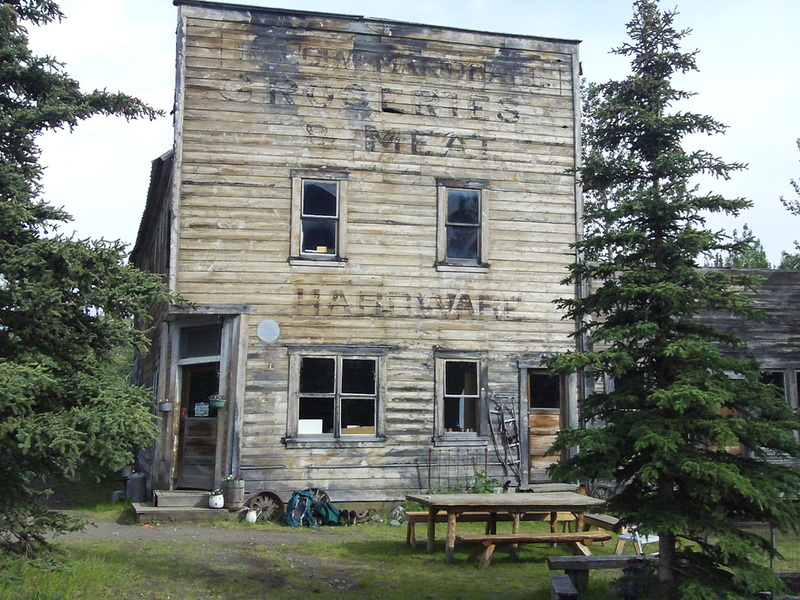 I rode another 93 miles and arrived in Tok, AK. I had ridden 511 miles on Day 5. The total mileage was 2,554 miles in the first 5 days and I had made it to Alaska! 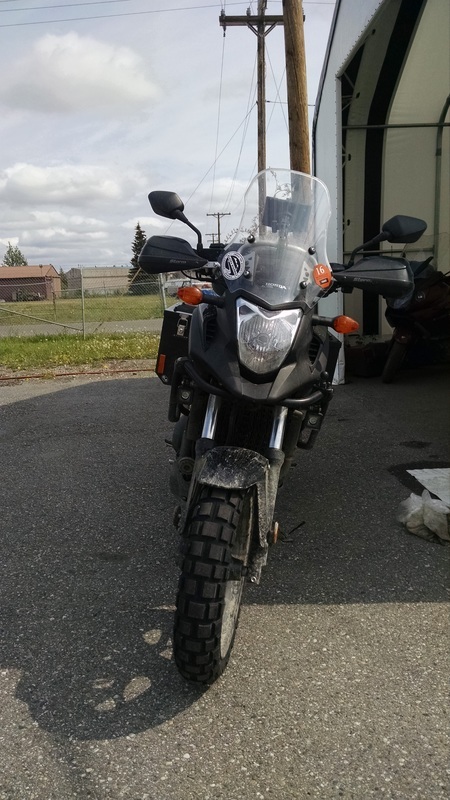 On Day 6 I got started early and rode the 204 miles into Fairbanks where the Honda dealer was waiting with a new set of tires to replace the stock highway treads. I had a Continental TKC80 knobby installed on the front and a Heidenau K78 installed on the rear. Along with an oil change I was ready for the unpaved roads ahead and whatever Alaska had to offer. A new set of “shoes” on the Honda! At every stop someone asked about the Honda. It had performed flawlessly. Plenty of power and great economy. Not even the Honda dealer in Fairbanks knew how great a motorcycle the NC700 was. They didn’t even have one on display! They did have lots of Harleys and BMW’s, but I could buy THREE Hondas for the price of a BMW GS or Harley! In terms of operating costs, the Honda had them all beat. 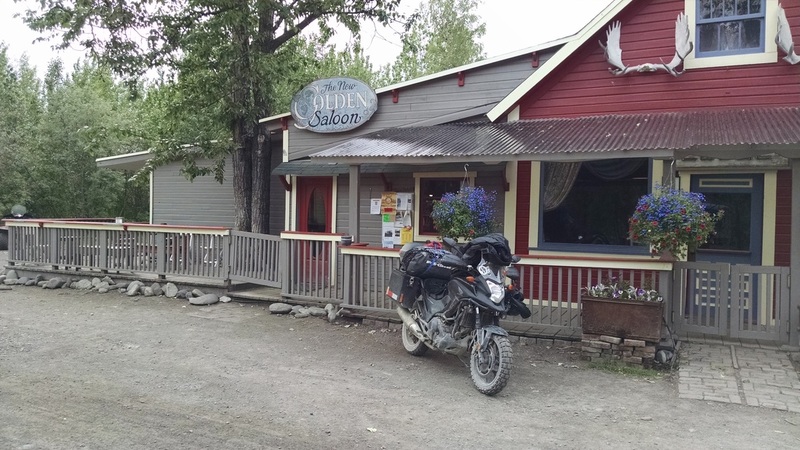 I had originally planned on staying in Fairbanks that night, but since it was only early afternoon I grabbed some lunch and started north for the Dalton Highway. First, I stopped at a parts store and bought a 1-gallon fuel can. Full of fuel and now with a 1-gallon reserve I headed north. 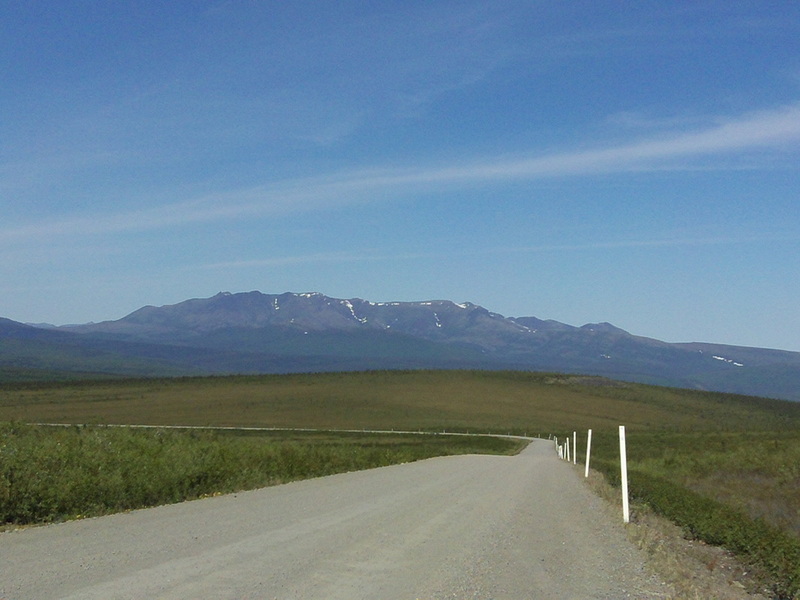 It is 84 miles of paved road from Fairbanks to the start of the Dalton Highway, also known as the “haul road”. (Some of the paved roads were rougher than the dirt roads due to frost heaves and broken surfaces.) 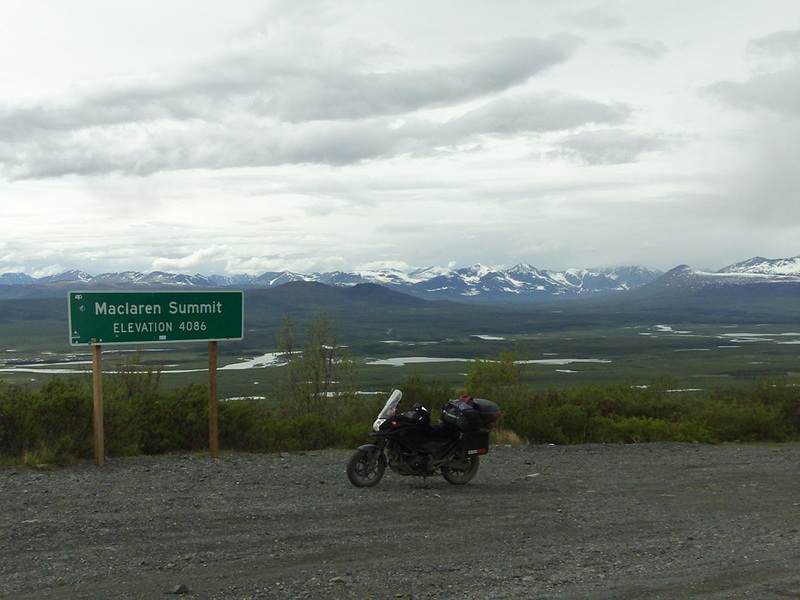 After a stop for a photo, I turned north on the unpaved road headed for the Yukon River camp and gas, another 56 miles north. 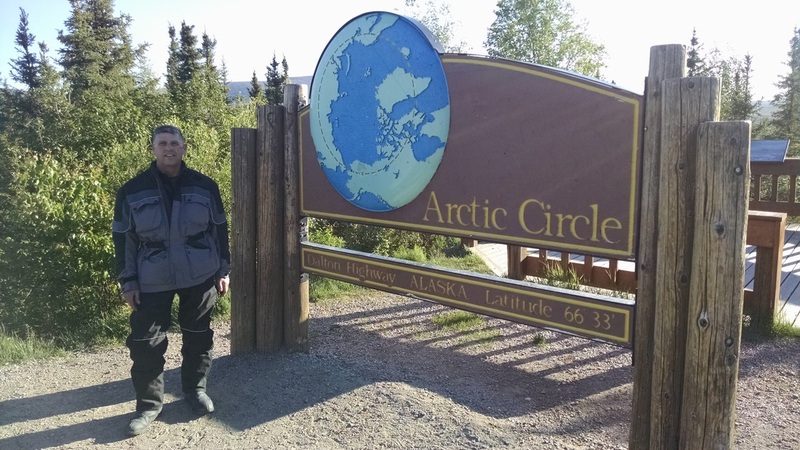 After getting fuel and a snack at the Yukon River, I rode the next 59 miles to the Arctic Circle. This is a mandatory photo opportunity. There is a "wayside" and a sign marking the line at 66.33 degrees north. I met a group of tourists from China on rented BMW’s, took a few photos and then continued on to Coldfoot. 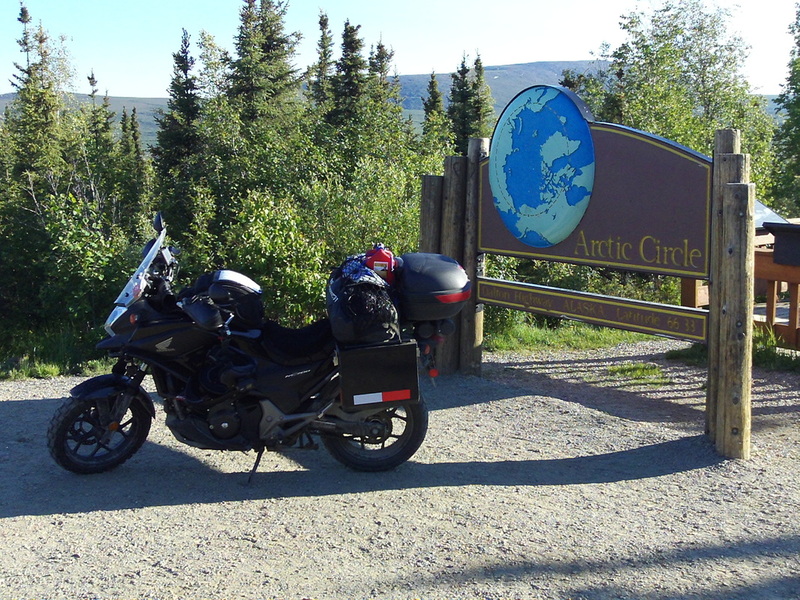 After my service stop in Fairbanks, I had ridden 259 miles north of Fairbanks and 60 miles north of the Arctic Circle. I arrived in Coldfoot about 10:30 pm. Coldfoot is an ugly truck stop on the haul road. I had supper in the trucker's cafe. The truck stop offers dorm-type rooms across the parking lot for workers on the pipeline, but since the weather was clear, I elected to camp for free alongside the "motel". The picture I took of my camp was at exactly midnight on June 9th. Including the 205 miles from Tok to Fairbanks in the morning, I had logged 477 total miles on Day 6. It was too light and too noisy to get much sleep! 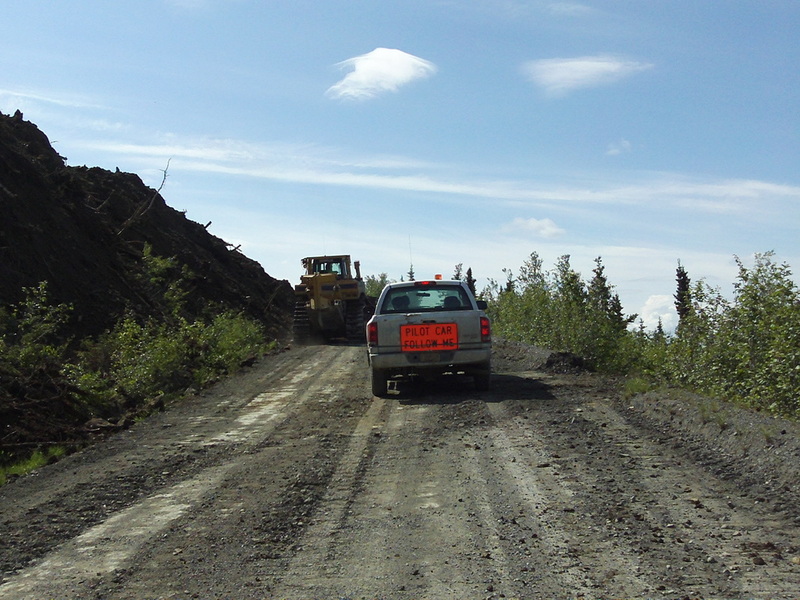 Trucks came through all night and construction on the haul road never ends during the short summer season. So at 4:00 am I got up, repacked the bike and refueled. I was at the cafe when it opened with a breakfast buffet at 5:00 am, and on the road back south about 5:30 am. I had elected NOT to continue riding the next 240 miles north to Deadhorse. 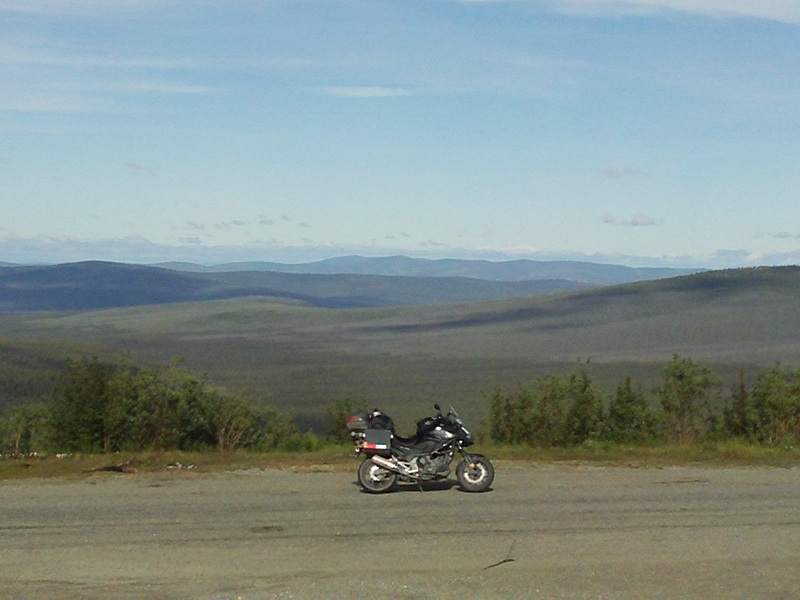 The riding was on the Dalton Highway easy, but boring. I just couldn't get enthused about riding 240 more miles up the Haul Road, only to spend $200 for a room and turn around and ride the same road back the next day. (The two-day schedule is a “best case” assuming that I did not run into rain or snow which would make the road dangerously slippery!) I did sacrifice riding over Atigun Pass and the views of the Brooks Range, but I would see plenty of mountains and over 1,000 miles of dirt roads in the next few days. I was already ahead of my estimated schedule, and cutting off 2 days on the Dalton further advanced my itinerary. 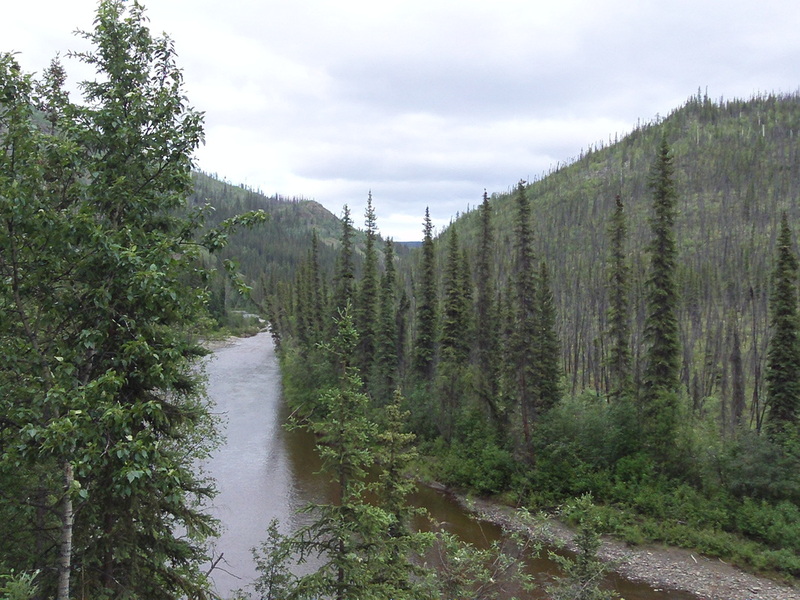 Day 7 I rode south back to the Yukon River, refueled and then rode to the junction with Alaska Hwy 2 where I turned west toward Manley Hot Springs. From this intersection, the “highway” is a dirt road for the 76 miles to Manley. The riding was great across the ridge tops. About an hour from Manley I ran into a 10-mile stretch of very rough road construction with jagged rock. Bulldozers were cutting a ledge into the sharp blasted rock. Thankfully, I made it through without any flats. I arrived in Manley mid-afternoon. I took a tour of the town, had a drink and a snack at the Roadhouse, gassed up and once again realized it was too early to stop for the day. So I headed back towards Fairbanks which was 161 miles away. Unfortunately, this meant that I had to retrace my route through the construction zone but I again negotiated the jagged rocks with no punctures to my still new knobby tires. 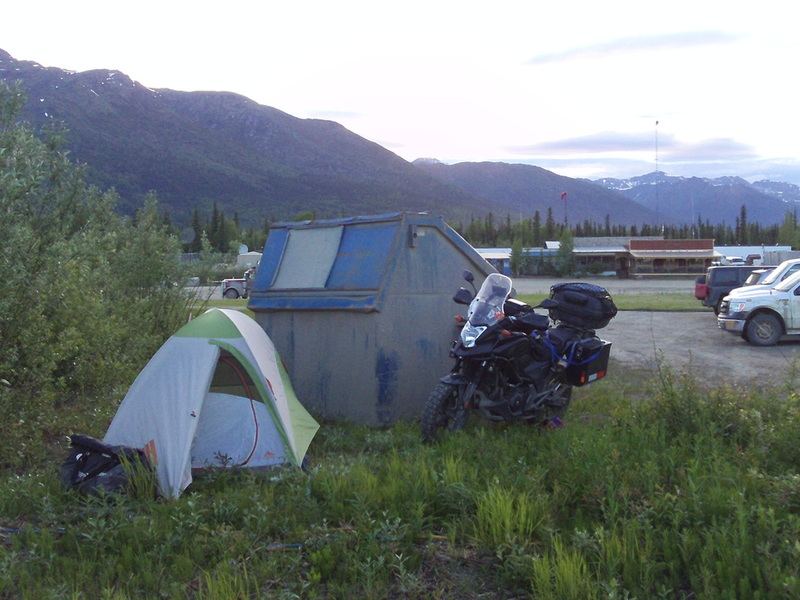 I treated myself to a motel and a soft bed in Fairbanks after a long, mostly off-road ride of 412 miles on Day 7. Day 8 found me riding south from Fairbanks on Hwy 3 toward Denali. 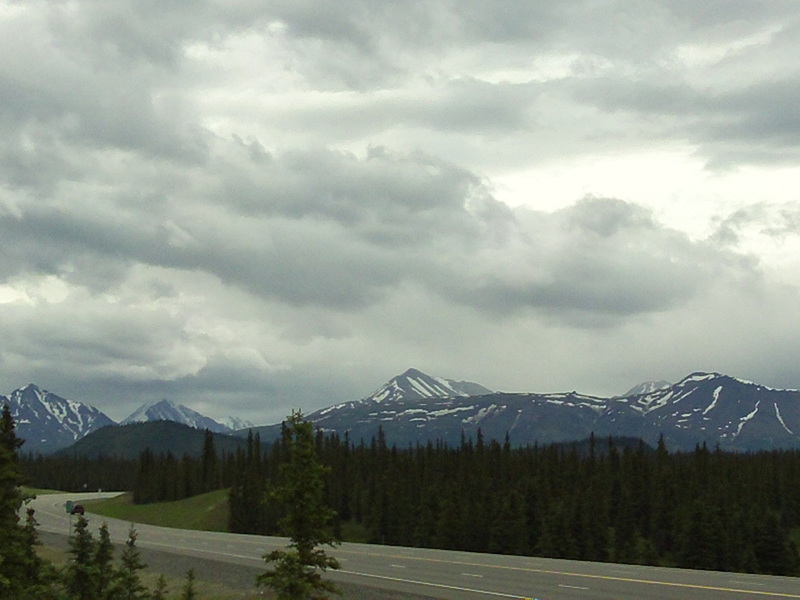 It was another rainy day and Denali was not visible from the highway. 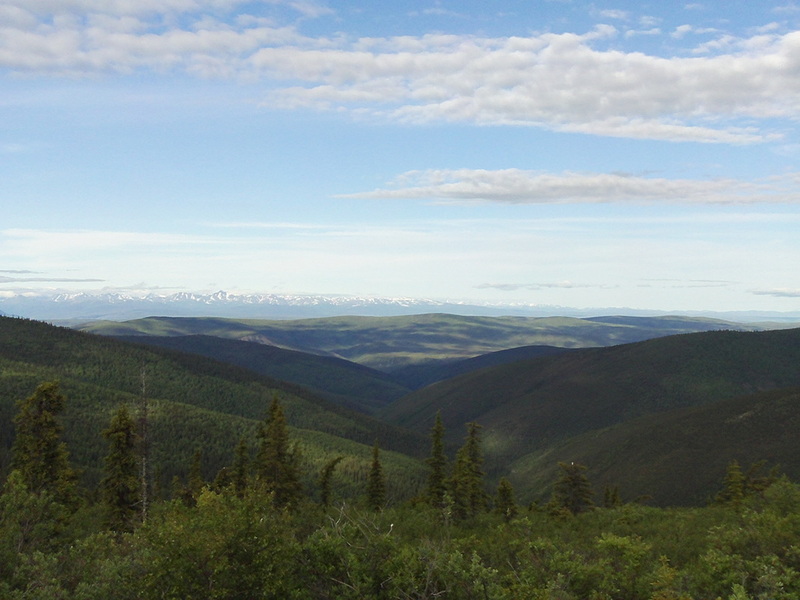 Looking west into Denali National Park. Denali is hidden in the distant clouds. 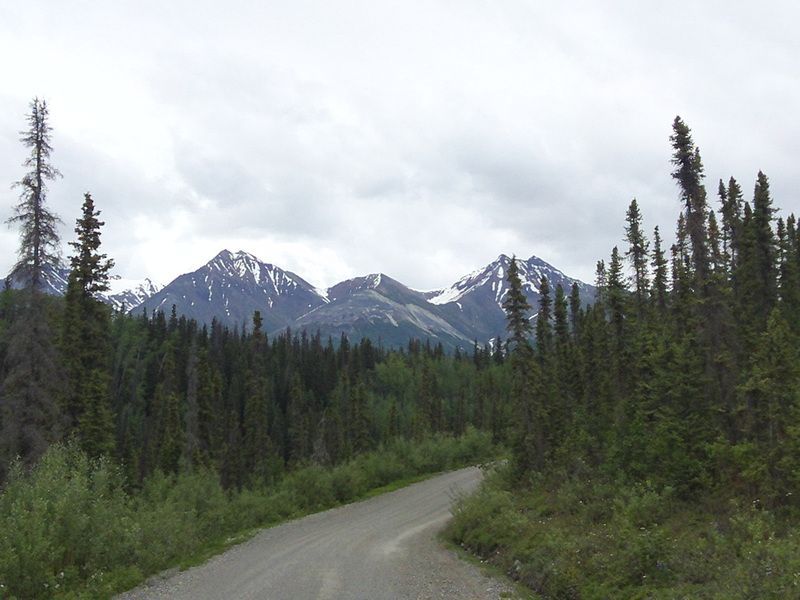 After a light lunch in Cantwell, I turned east on the "Denali Highway", a 136-mile unpaved road that runs east to Paxson on Hwy 4. This was some of the best Alaskan scenery yet! I saw one cow moose, then another cow with a calf. 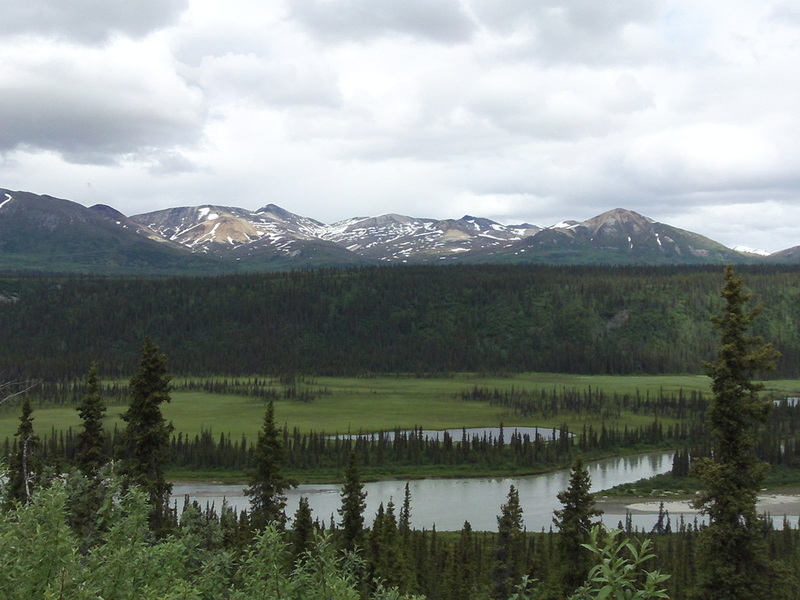 The Denali Highway is 136 miles of mountains and lakes and whitewater rivers. 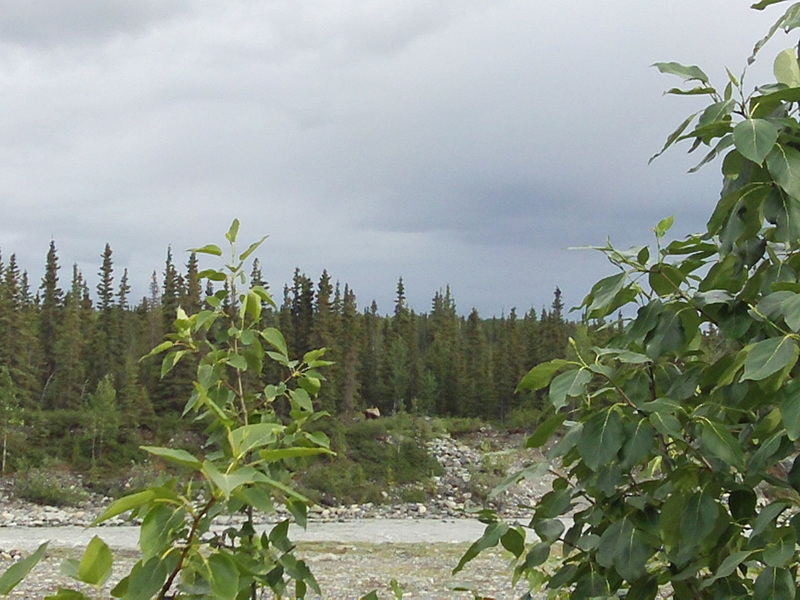 This was my vision of “real Alaska”, and it was right here on the Denali Highway! Soon the riding was complicated with more hard rain and wind and a muddy road. This made the lodge at the Maclaren River a welcome sight. After some hot coffee and fresh banana bread I was ready to complete the leg and look for a campsite near Paxson. But the higher altitude, cold temperatures and rain made setting up camp unappealing, so I turned south on Highway 4 when I reached Paxson towards a break in the clouds in the distance. As I approached Glenallen the weather improved dramatically. 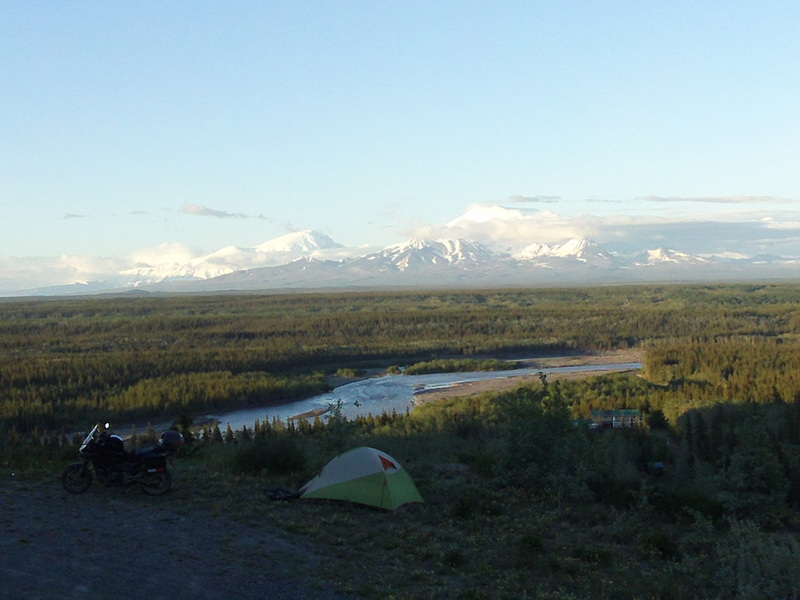 I found a great campsite overlooking the Copper River (with fish wheels turning in the river) and the Wrangell Mountains in the distance. Day 8 equaled 359 miles. Day 10 continued south on Hwy 4 to Valdez. 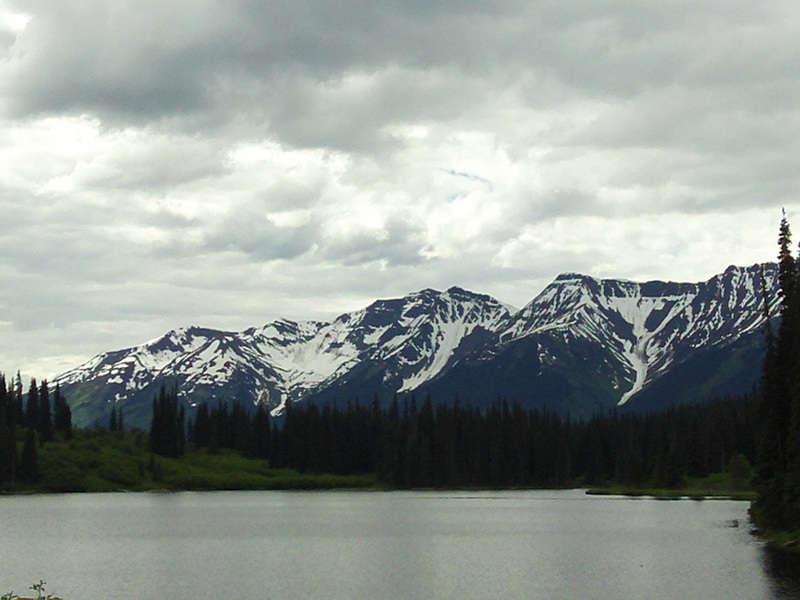 Continuous mountains rose ahead and topped out at Thompson Pass. 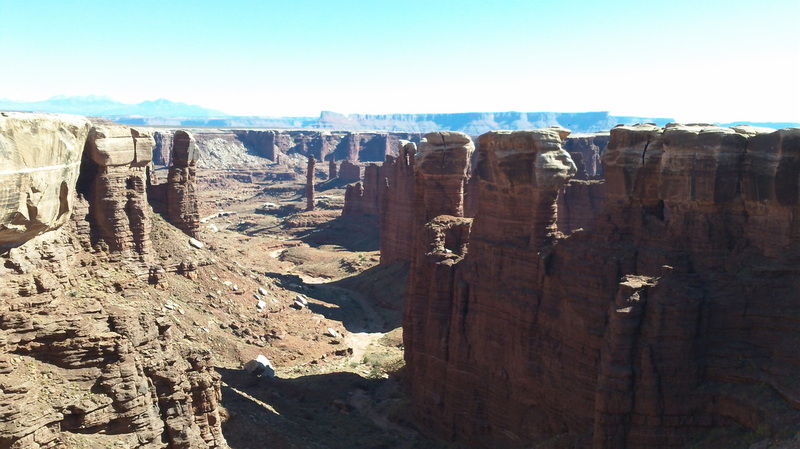 Small photographs can't capture the immensity of the landscape. Waterfalls plunged from the snow-covered cliffs. The view from Thompson Pass. Valdez is far to the south. Valdez was somewhat of a disappointment. It is a dock for the cruise ships so there are plenty of tourist shops. I didn’t see anything to hold me longer. Since it was only noon, I headed north to the junction with Hwy 10 and the Edgerton Highway towards McCarthy. 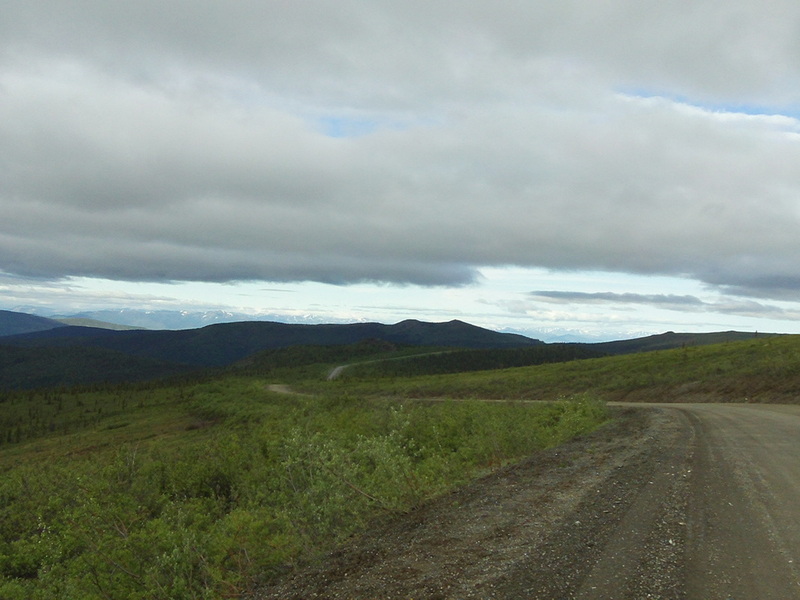 This road is paved for the first 34 miles to Chitina, and then dirt for the next 59 miles into McCarthy. 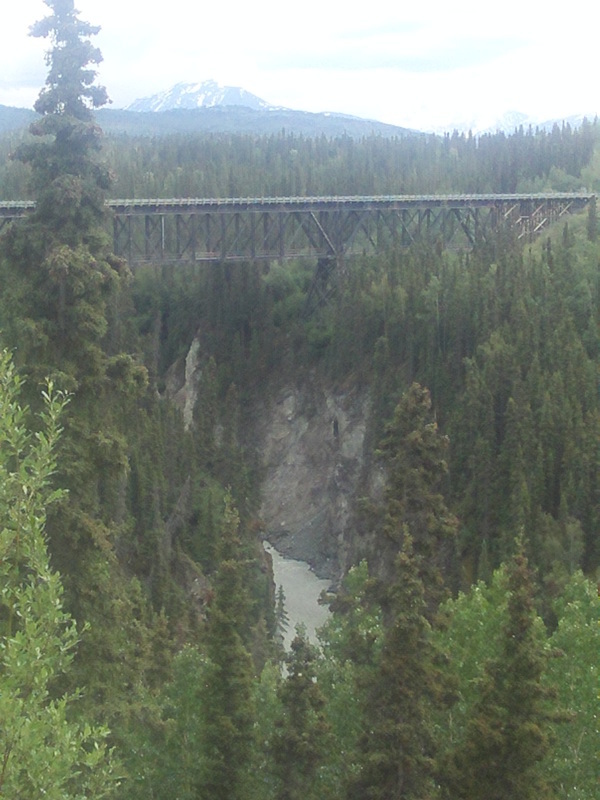 The road crosses an old wooden bridge that once carried the train into McCarthy, about 250 feet above the river below. The riding was spectacular, despite more cold driving rain showers. 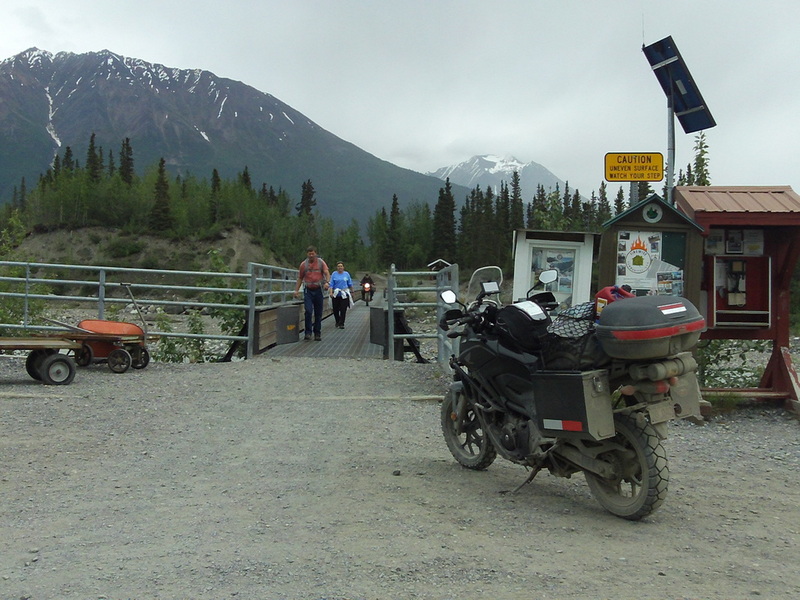 The road ends at a parking lot with a foot bridge across the Kennecott River. 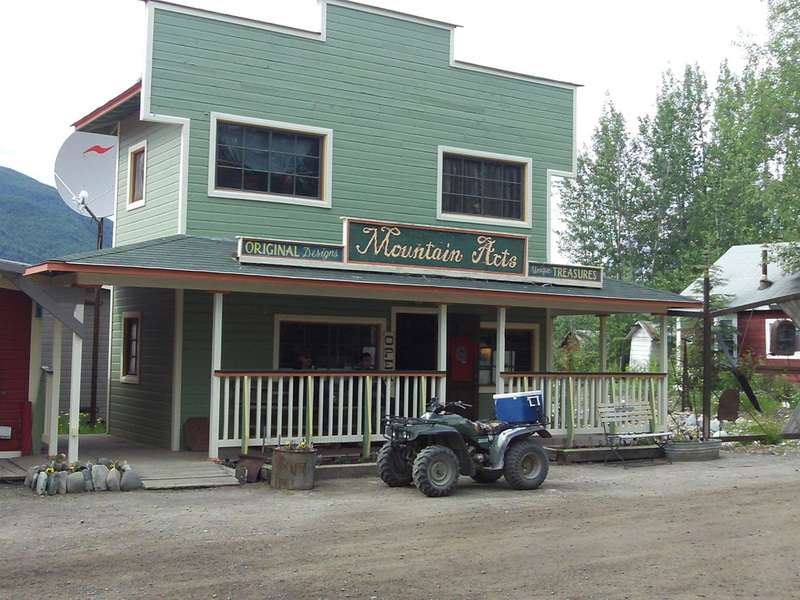 But motorcycles and atv's are allowed on the bridge so I rode directly into town and parked right in front of the Saloon! After a whiskey, a beer and a bison burger I was revived. McCarthy became a ghost town after the neighboring Kennecott mine closed. Today, the mine is open for tours by the Forest Service and McCarthy is an interesting combination of trim restored buildings, old buildings in need of repair, and lots of buildings that are sinking into the woods. Most of the workers are only there for the summer. But about 50 people live year-round in the area. It is this collection of quirky people that is supposed to have been the inspiration for the TV show, “Northern Exposure” back in the 1980’s. I camped just across the foot bridge as a light mist started to fall again. After getting my tent set up, I crawled in and fell asleep. I woke about an hour later to a heavier rain and got out to cover more of my gear. Directly across the river was a solid brown patch. Then the patch moved and turned into a cow moose - less than 75 yards away. Day 9 was a short day of only 300 miles. According to my guide books, McCarthy was supposed to have gas. But the "vendor" decided not to open this year. Luckily I still had my 1-gallon reserve with me and had plenty of gas to ride back the 80+ miles to the store at Kenny Lake the next day. Day 10 started nice, and the ride back to Kenny Lake went fast. I was able to cruise on the damp dirt road at 40 mph. 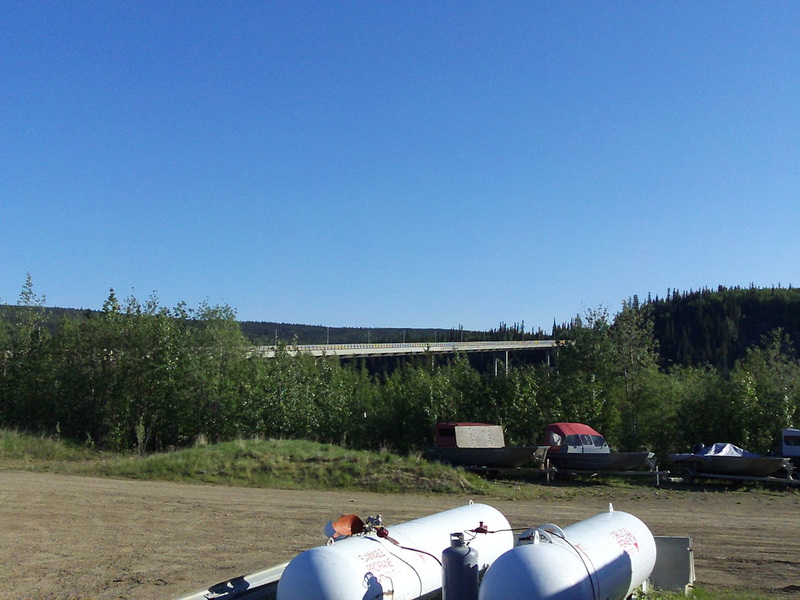 After Kenny Lake, I continued on the Old Edgerton Loop back to Hwy 4 and then to the Tok Cut-Off on Hwy 1. I arrived in Tok after enduring some nasty side winds and repeated rain showers. By mid-afternoon I had covered 258 miles and found a motel for a hot shower, good meal and sound rest. A tour bus arrived at the motel and a local musher was scheduled to make a presentation to the group. He turned out to be Hugh Neff, the 2016 Yukon Quest champ who lives in the Tok area! 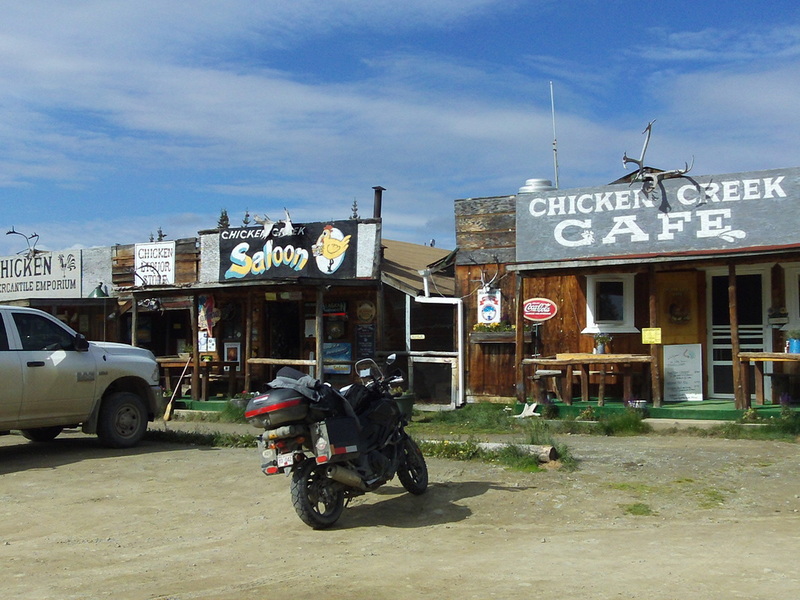 On Day 11 I left Tok and rode east to Tetlin Junction and then turned north on Hwy 5 to Chicken. The 66 miles to Chicken is paved right up to the last mile before "town". Like every day so far, the scenery was fantastic and the vistas were endless. Chicken has a few businesses that offer food and fuel and cabins. I stopped at the Chicken Creek Café. I had some coffee and a snack, refueled at the single pump and then rode the next 30 miles of dirt road to "Jack Wade Junction". At the junction, I turned north toward Eagle. Visiting Eagle had been my main goal for the last 40 years since reading “Coming Into The Country”. This was another beautiful stretch - 65 miles of unbroken wilderness crossing countless ridges and winding along sheer drop-offs down into valleys 1,000 feet below. 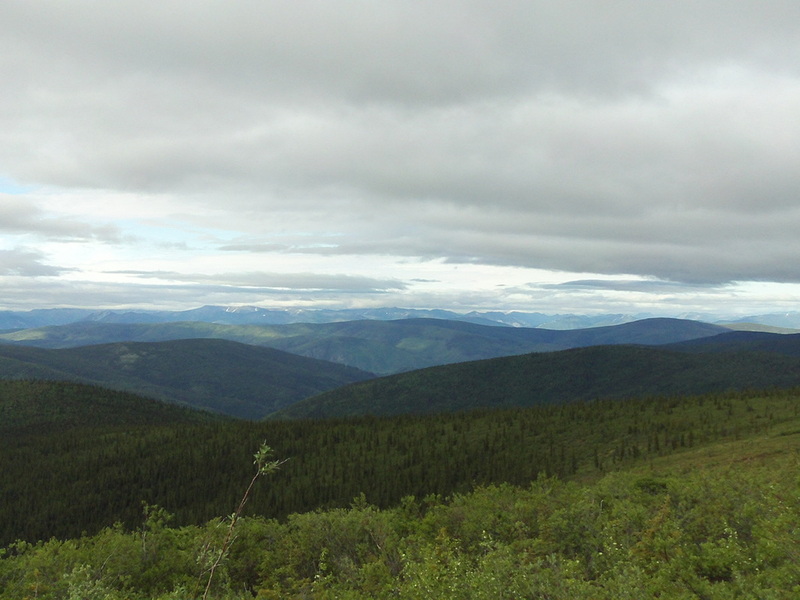 Eagle was the hub for early gold claims in the Yukon region. 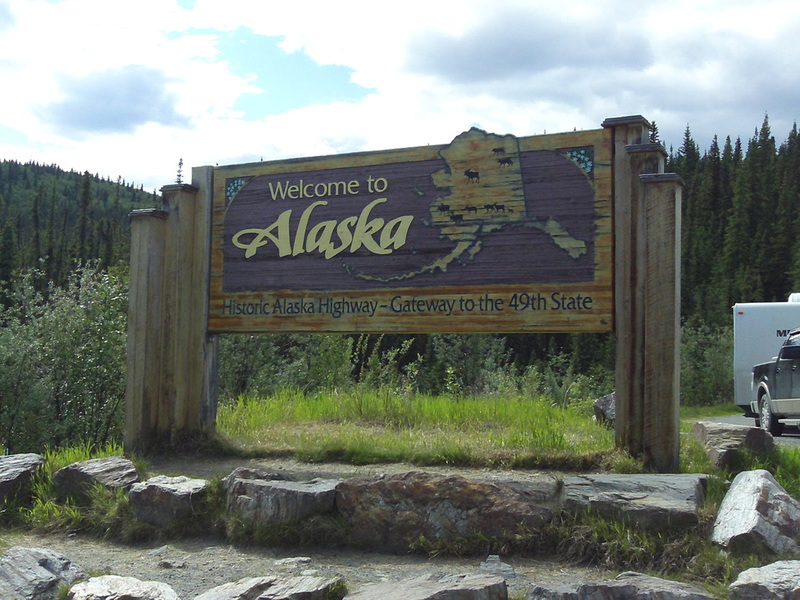 It was incorporated in 1901, the first “city” in the interior of Alaska. Eagle then lost its prominence following gold strikes in the Klondike regions upstream, and later in Nome. 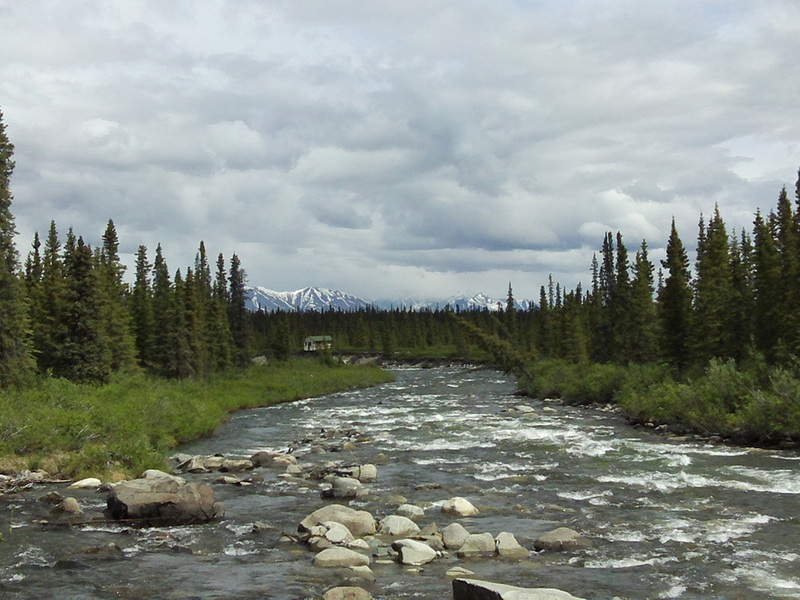 But it remained important since all the river traffic on the Yukon had to pass Eagle and an Army fort and federal court was established to maintain order on the frontier. After reaching Eagle, I found the camp ground but again decided it was too early to stop for the day. The new cafe (replacing the one destroyed in 2009 by a flood on the Yukon) was open for lunch so I refueled myself and the Honda at the only gas pump in town. I then retraced the 65 miles to the junction, before turning east to the Canadian border once again. 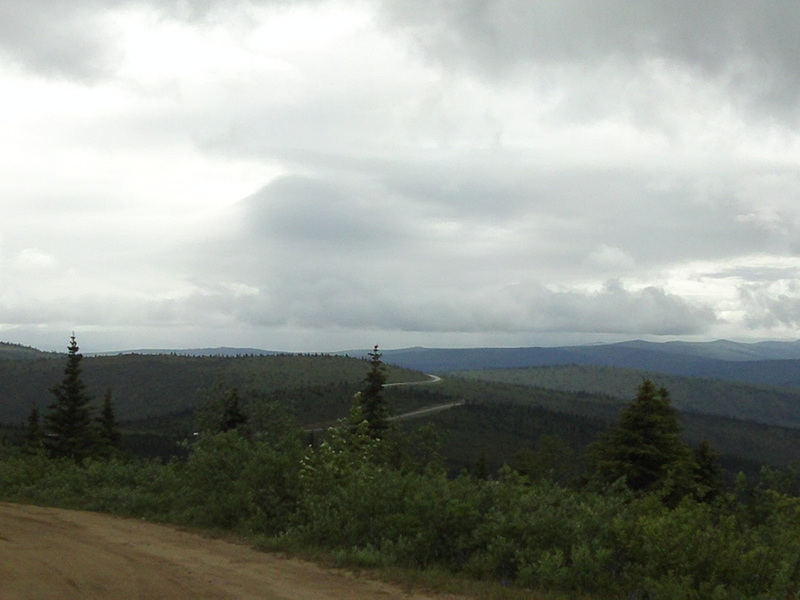 Nine miles later I re-entered Canada and then rode the "Top of the World" highway into Dawson City, Yukon. The Top of the World Highway runs along a series of ridges. You are looking down on the surrounding rolling mountains, with higher snow-capped mountains in view to both the north and south. It is 79 miles of mountain wilderness. I saw two other vehicles on the entire stretch! I had heard that numerous vehicles go off the steep mountains every year when the scenery causes them to drift to the edge of the road with no guard rails. 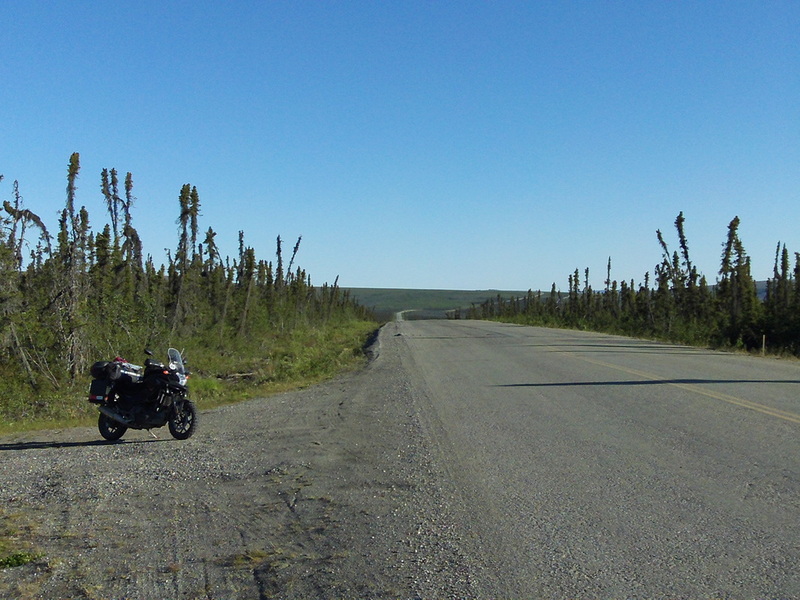 The lonely Top of the World Highway in Yukon Territory. I arrived at the Yukon River and took the free ferry across into Dawson City. After a good supper, I looked for a place to camp without having to cross back and go to the official campground. 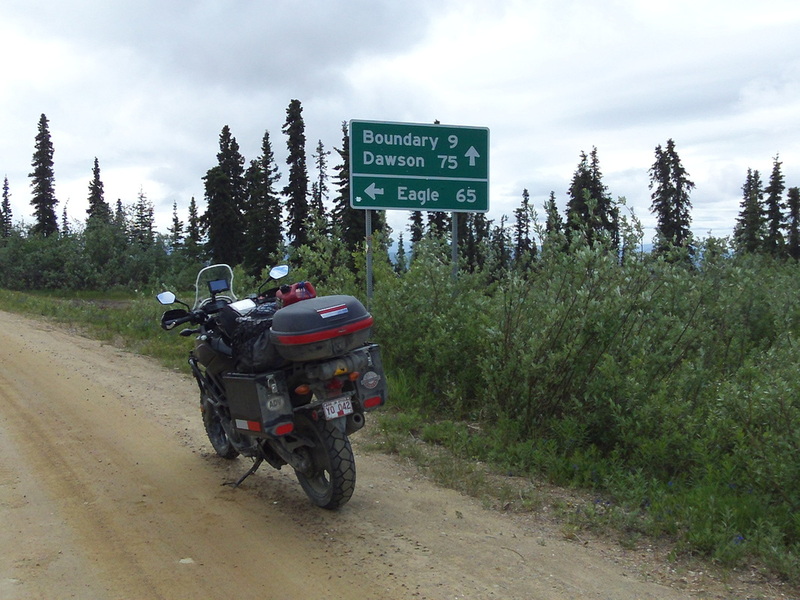 I had ridden 325 miles from Tok to Chicken, then to Eagle and back to Dawson City. I thought the city park might provide a good free campsite, but the bright Midnight Sun and the highway traffic made it impossible to sleep. Finally, I gave up and hit the road at 2:30 am. This turned out to be my longest day of riding. The dirt riding was over at Dawson City. Now it was 100% paved roads all the way home. Highway 2 south from Dawson City was some of the least scenic and the very early morning was perfect for covering miles - as long as I could stay awake! I rode several hours without passing even one vehicle. I rode 222 miles to Carmacks before breakfast! I then continued to Whitehorse. Now I needed to repeat the route (backwards) from Whitehorse to Teslin and then Watson Lake. Just before Watson Lake, I turned south on Hwy 37, also known as the Cassier Highway. 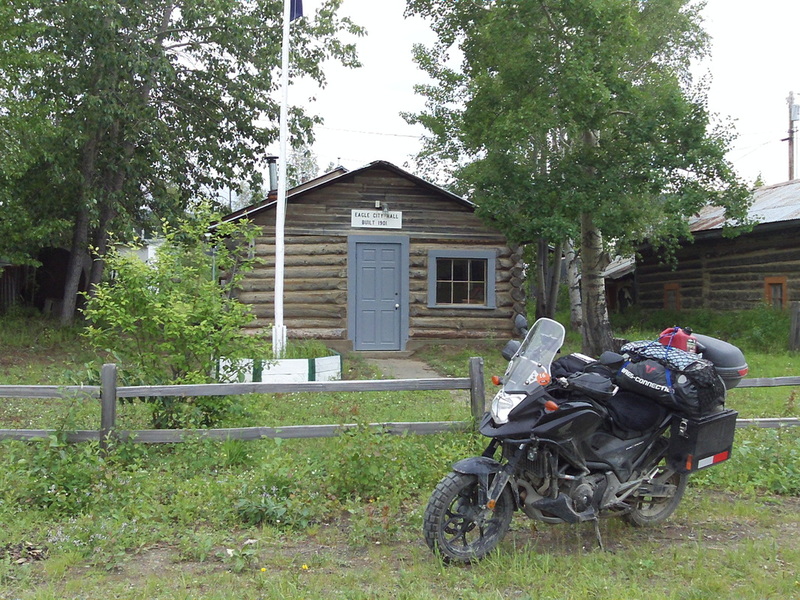 After a cold sandwich at the gas station for “supper”, I pressed on towards Dease Lake and a motel room for the night. 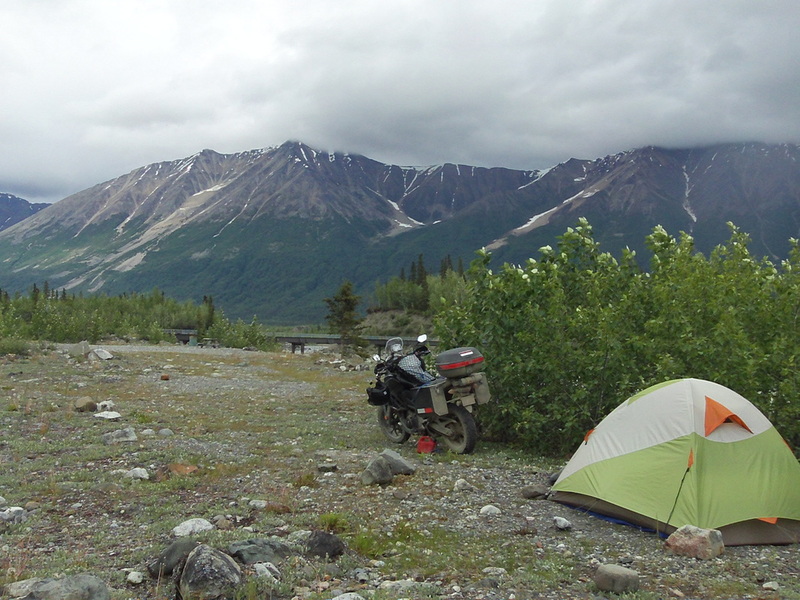 This last ride included another driving rain storm and I arrived cold and tired in Dease Lake (in the middle of nowhere) to a motel with no vacancy! Plus, the only gas station in town had just closed for the night. Luckily, I found a great campsite down the road a few miles along a rushing stream and crashed into my sleeping bag. I had ridden 743 miles on Day 12. Once again, I relied on my 1-gallon reserve to provide enough fuel to reach the next town on Day 13. 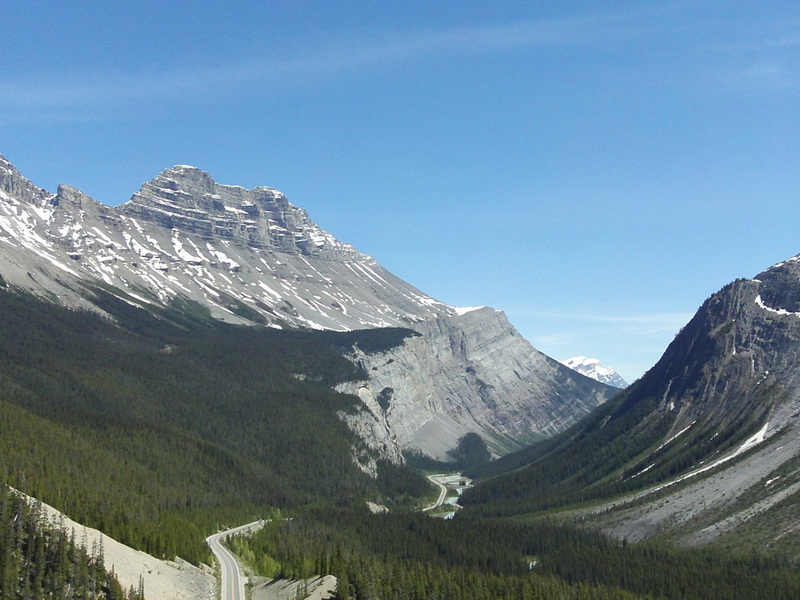 I continued south on Hwy 37 through the beautiful mountains of British Columbia. After turning east on Hwy 16, I set Prince George, BC as my goal for the night. The weather was good until I stopped for gas in Smithers. A few miles later the temperature dropped and the rain started, first light and then heavy. I stopped again in Fort Fraser to add more layers of clothes along with my heated vest. A Harley rider pulled in after me and we agreed that we would look for the first available motel in Prince George. We also agreed that it seemed incredible that it takes three days just to ride the length of BC! The first motel was full, but they directed us to another very nice and reasonable motel that still had two rooms. (The motels were full because of several days of rain that had washed out Highway 97 north to Dawson Creek, stranding many travelers.) It was a long, cold and exhausting 598 miles on Day 13. But I did see several bears, including a chocolate sow and three brown cubs on the shoulder of the highway. Thankfully, the next morning dawned clear. From Prince George, I turned south on Hwy 97 toward Washington state and the U.S. border. My original plan had been to ride back to Jasper, and then to Calgary before crossing into Montana and riding through Glacier National Park. 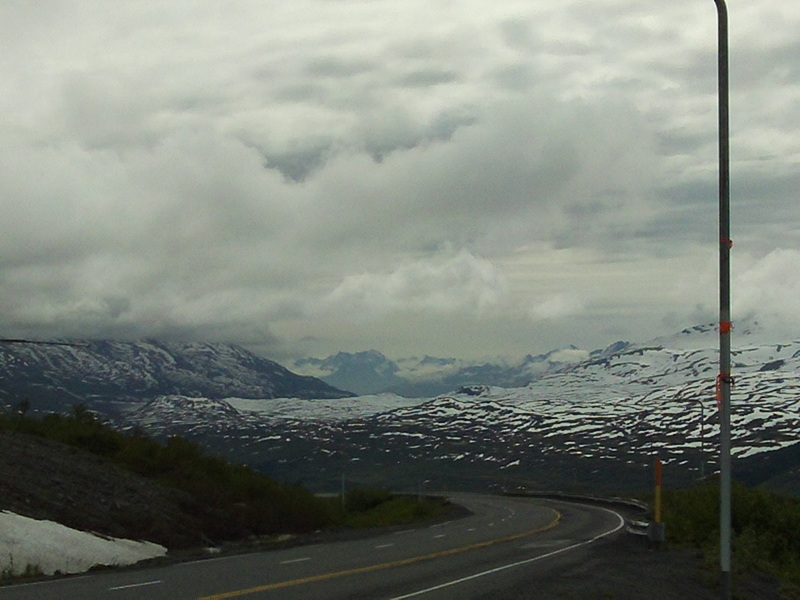 Unfortunately, I was too early in the season and the road across the glacier field was not open until July. So I elected to ride south and cross into Washington before continuing on through Oregon and Idaho. 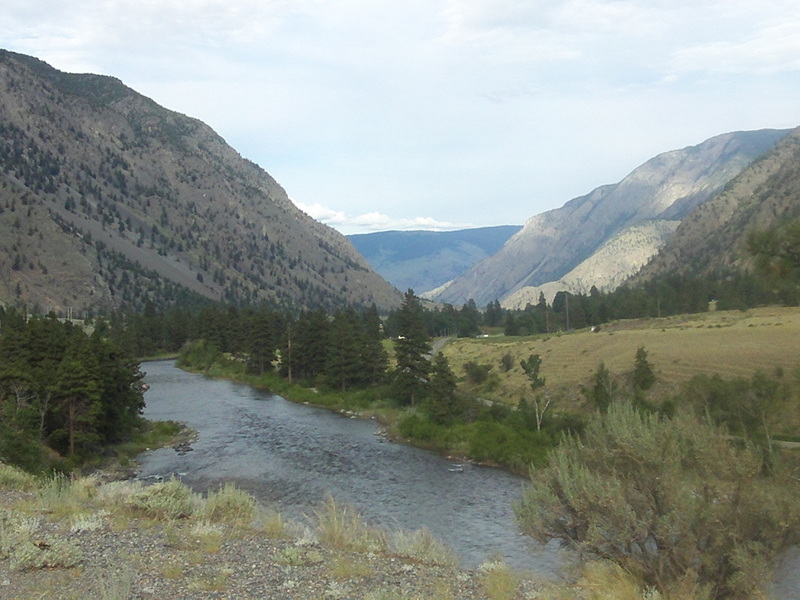 I crossed the border at Osoyoos, BC and started looking for some place for supper, and then a campsite. But it was getting dark – I was used to being able to ride until 9:00 pm or later farther north! Instead, I ended up finding a cheap motel in Omak, Washington as the sun fell behind the mountains. Day 14 was a total of 545 miles. Day 15 started out nice and I looked forward to one more day of relaxed riding. But before long a light rain began to fall. 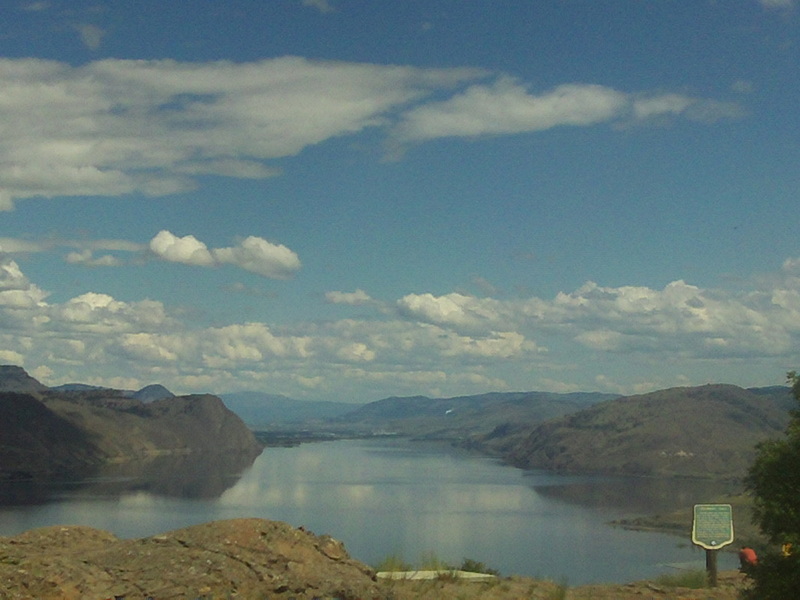 Then a heavy, wind-driven rain pummeled me as I rode through the Columbia River valley. The cold rain continued as I crossed into Oregon, but then was replaced by terrible cross winds. More than once I felt a momentary slip as a sideways gust lifted my bike a fraction of an inch on the wet pavement. Finally, the sun came out as I approached the Idaho line. As a good omen, the bad cross winds switched to a westerly tail wind as I left Boise and rode the last stretch to Mountain Home. It was about 7:30 pm when I reached my relative's home. I had ridden another 550 miles on Day 15. In total, the round trip totaled 7,122 miles. Over 15 days I had averaged 475 miles per day! I had changed oil in Fairbanks. Otherwise, the Honda did not use a drop of oil. I had no flat tires and no equipment problems. The knobby tires were well-worn but rolling smooth after over 4,300 miles - over 1,000 on unpaved roads and 3,300 on pavement. I am ready to do it again! 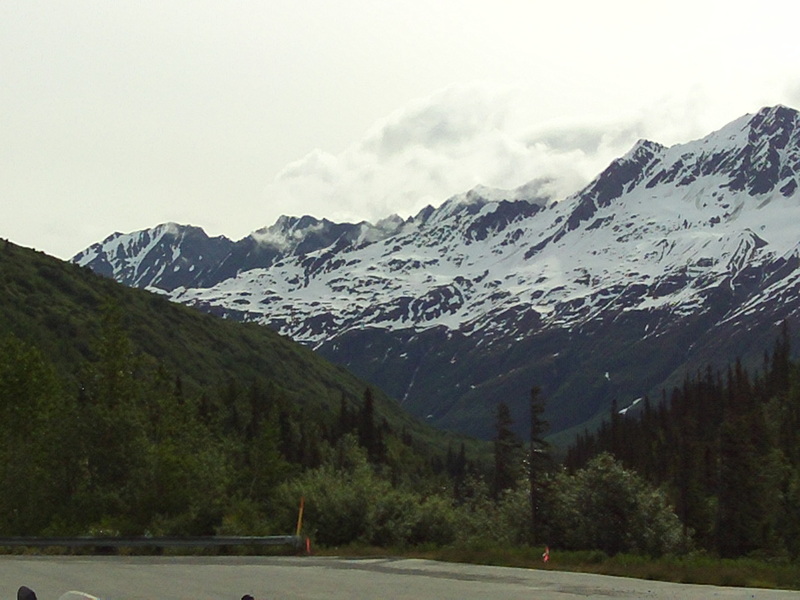 I would like to make the same trip in my 4x4 pick-up to allow for more time for exploration of remote Alaska. I would also like to do a longer highway-only motorcycle ride to see the rest of Alaska that I didn't include in this first trip! Is the RX3 Cyclone the dual sport ADV motorcycle the other manufacturers should be building? I recently purchased my ninth motorcycle. My requirements were a lightweight, simple, and versatile motorcycle for dual-sport riding. The term “dual-sport” means different things to many people. 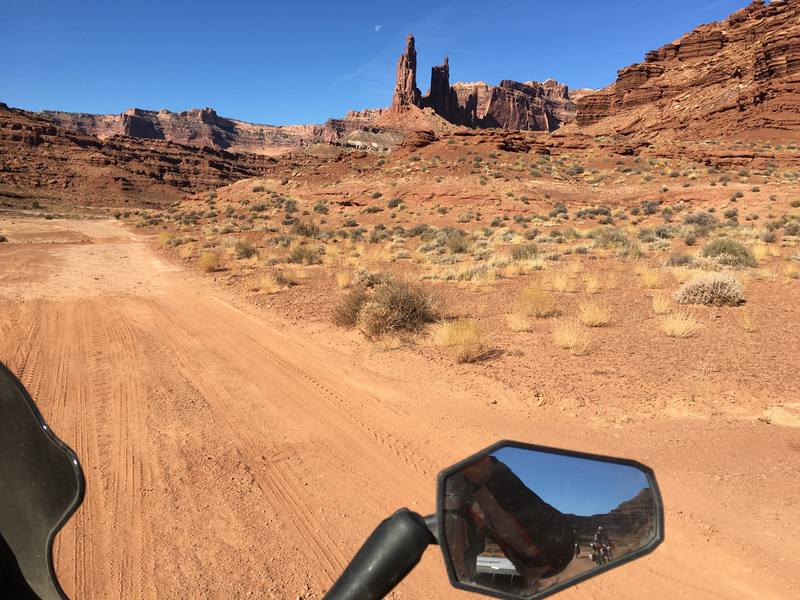 For me, a dual-sport motorcycle is one that you can ride from your home, down the highway to the start of an unpaved road section, and then ride back home. It should be capable of multi-day rides. A dual-sport motorcycle is not a road bike, not a track bike, and not a motocross bike. It is a compromise that you can ride on many routes and is not a special-purpose bike on any of them. After much deliberation, I chose the RX3 Cyclone imported by CSC Motorcycles from Zongshen in China. This explanation is going to require a recap of my motorcycle riding experience. My first motorcycle was a 1200cc Harley Sportster. After all, I lived in Wisconsin. After a few years I traded the Sportster for a 1600cc Harley Street Glide. Next I bought a Kawasaki Vulcan Voyager, a huge 1700cc touring bike. Obviously, my riding was strictly highway. Looking back, I wouldn’t call it “riding” but driving a 2-wheeled vehicle. In fact, many “touring bikes” are so heavy that they are delivered with a reverse gear! In the middle of this era, I bought a 2-stroke Yamaha 175cc dirt bike to ride the back roads around my cabin near the Canadian border in Minnesota. By this time, I also had hundreds of hours of experience riding atv’s - but atv’s weren’t allowed on the forest roads in Minnesota or near my home in Wisconsin. Then my family went on vacation to visit relatives in Sedona, Arizona. Sedona is famous for spectacular red rock scenery. The best way to view the scenery and get high above the town is on a Jeep tour. I was mesmerized. I owned both a touring motorcycle and a street-legal dirt bike. I didn’t even know “adventure” bikes existed – motorcycles that could do BOTH! I immediately started studying about the capabilities of ADV bikes and the wide range of travel options that they provided. I had spent months of my life camping, hiking, canoeing, hunting and fishing. I had even raced dog sleds and gone on winter camping expeditions. I was meant to be a dual-sport rider! So I sold the Kawasaki and bought my first “adventure” bike – a Suzuki DL650 Vee-Strom Adventurer, a bike with a solid reputation and a cult-like following. 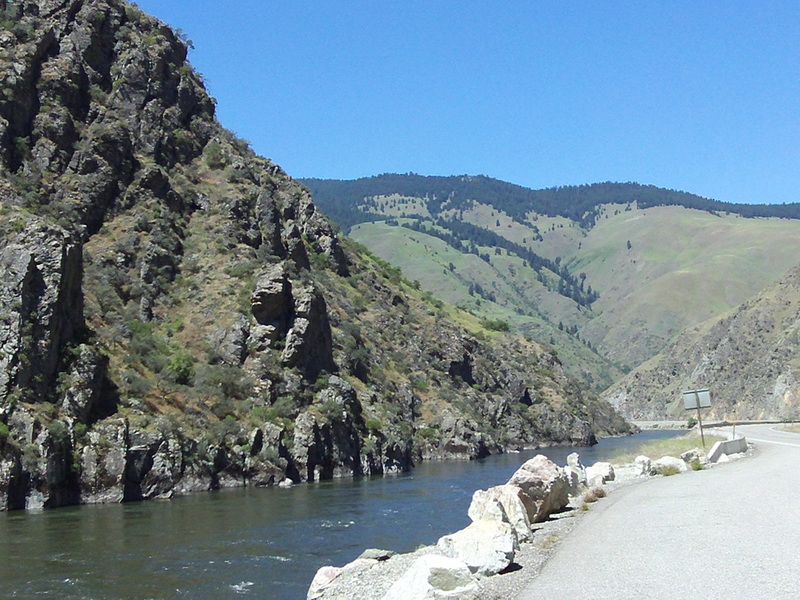 As October 2014 approached and I prepared to ride the first sections of the Trans-America Trail I also was looking ahead to riding the western “TAT” sections the following summer. In the process, I determined that the rougher mountain sections were too much for the Vee-Strom. I decided what I really needed was a street-legal dirt bike, so I also bought a Yamaha WR250R. Now I had TWO dual-sport bikes. By the time I left for Tennessee on my first multi-day adventure I had two fully-equipped ADV bikes! It took a day and a half to ride about 750 miles by highway from my home in Arkansas to the start of the official Trans-America Trail in Tennessee. Then I rode the combined paved and unpaved sections of the TAT trail back to my home in Arkansas. The round trip was 1,795 miles and I was hooked! I immediately set the date for the western TAT the next summer. But in the mean time I had also discovered the Backcountry Discovery Routes, or BDR series. I was, after all, a BIG customer of Touratech by now! 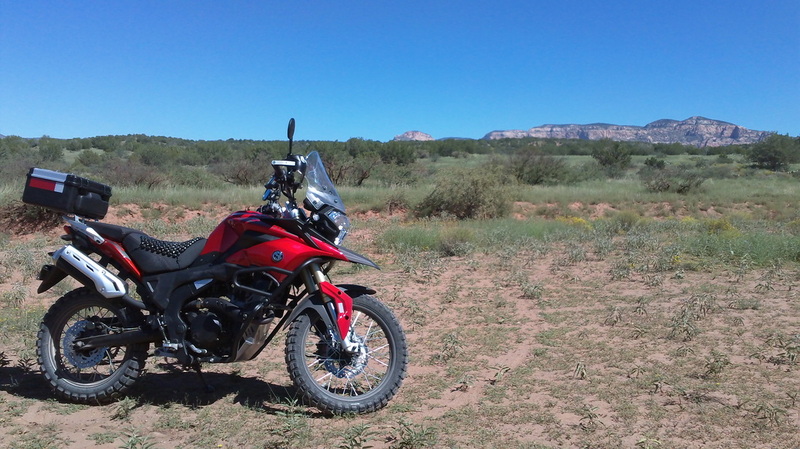 So before I would ride the western TAT I made plans to ride the Arizona route, or AZBDR. 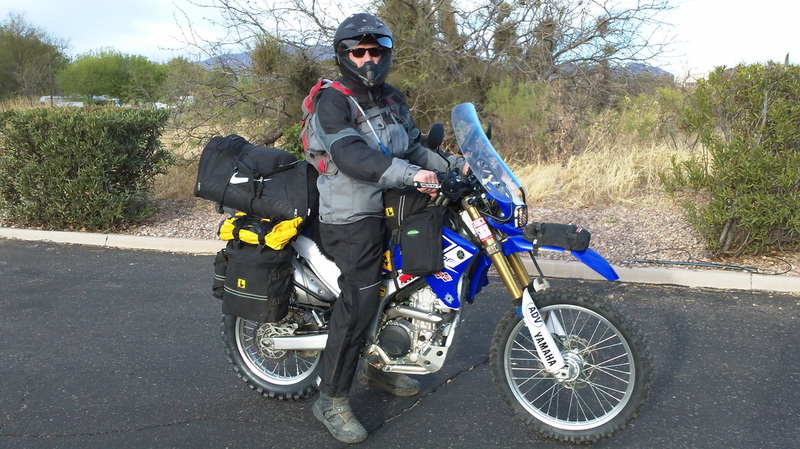 The picture below is me and the Yamaha WR250R leaving on the solo journey from Sierra Vista, AZ on my way to the Mexican border in April 2014. I rode down to the Mexican border and then turned north. 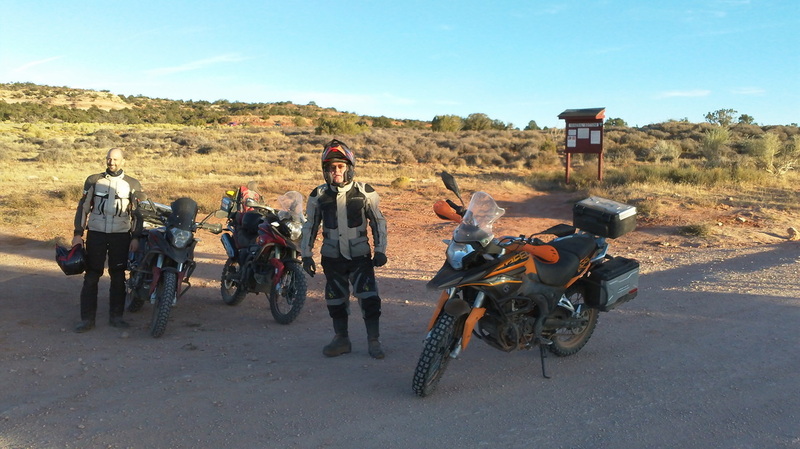 It took me only three days to ride to northern Arizona. 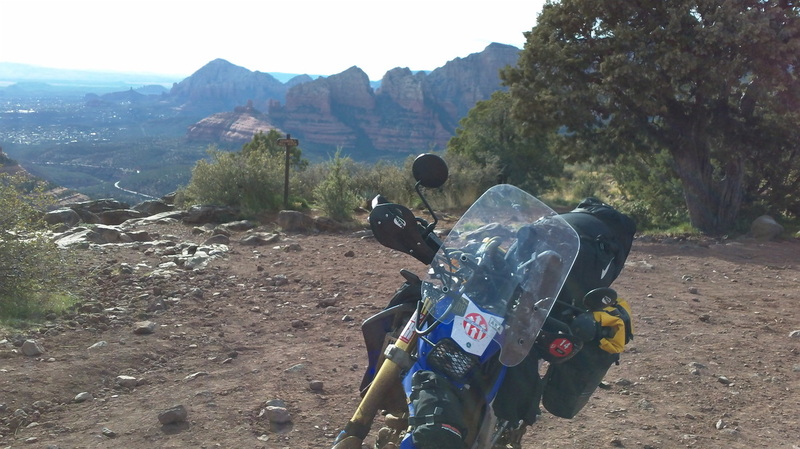 Then I turned off the BDR route and rode west to Sedona. I had completed the circle and returned to where I caught the adventure bike bug a few years before. 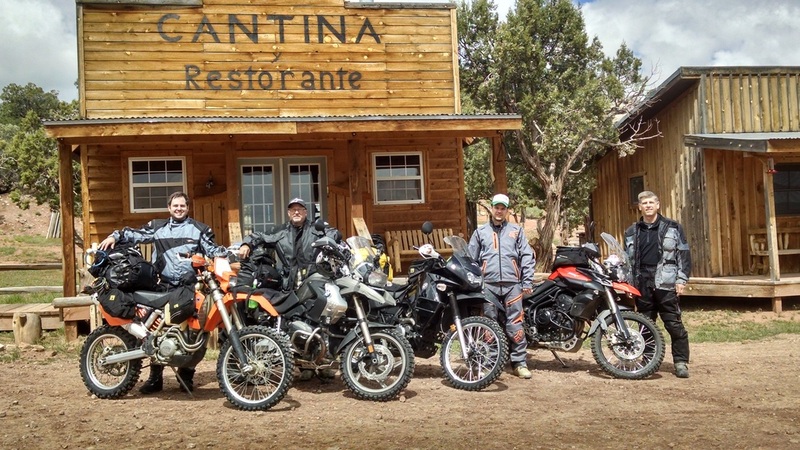 In late June, I met up with a group of riders planning to ride west from Arkansas on the TAT. I ended up riding with just one of these riders after the first day and we rode to Utah, and then turned back north and east on the COBDR route to where family was waiting in Denver. We crossed the plains, the foothills, and then the high mountain passes. The Yamaha ran perfectly. I was able to squeeze in everything I needed for 10 days of riding and camping. But it was an ordeal to ride almost 2,000 miles on a tall, stiff bike with a seat like a 2 x 6! 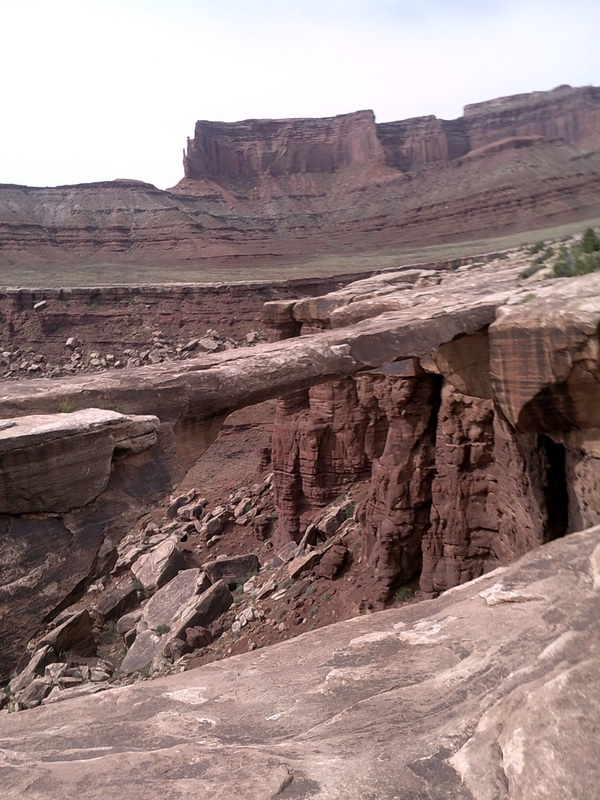 And there were a few times I fell over from that high perch on tough sections of the mountain trails, which didn’t inspire confidence when it came time to traverse the switchbacks with sheer 1,000-foot cliffs. 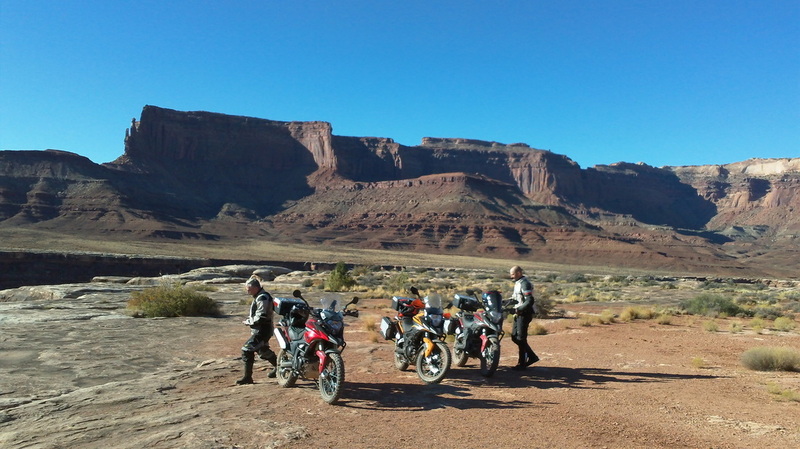 The end of this ride began planning for the NEXT adventure – Utah and the UTBDR! By now I had decided that the Vee-Strom no longer met my definition of a true, all-purpose adventure bike. And I also decided that I wasn’t going to subject my body to the discomfort of riding the Yamaha on my next trip, so I sold them BOTH! Thus began my next ADV bike build: A Triumph Tiger 800XC. The preparation process started all over again. I upgraded the windshield, transferred the aluminum panniers from the Suzuki, added a rear rack, added a skid plate and countless other “farkles”. Then I took off on an October road trip to the Overland Expo in North Carolina, with side trips to the Blue Ridge Parkway and the Tail of the Dragon. It was a successful camping shakedown for the UTBDR in 2015. 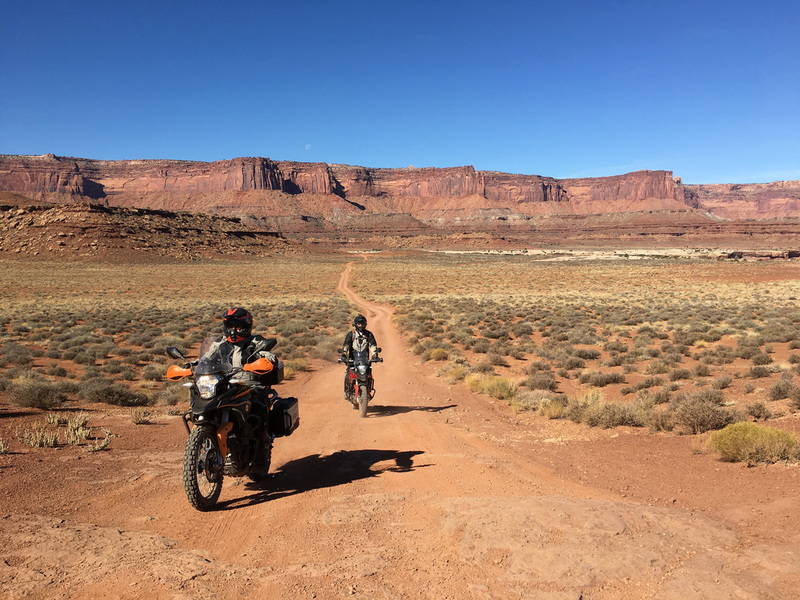 The Utah Backcountry Discovery Route includes some of the best scenery and varied roads available to dual-sport riders! 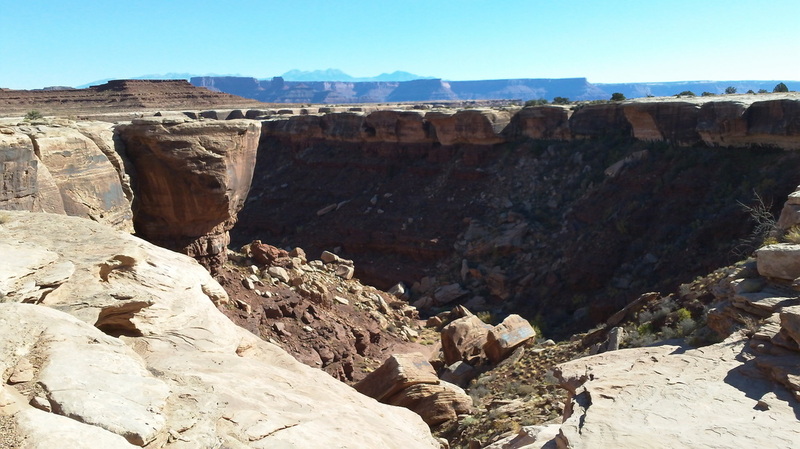 Our group of riders started near Moab and spent two days in this area before heading north. We had four different motorcycles in the group, my Triumph Tiger 800XC, my Son Aaron’s KLR650, my buddy Bob’s GS1150GS, and his Son Rob’s street-legal KTM 450. After making a loop around Utah, Aaron and I continued on to Monument Valley and then to Sedona, AZ for a total of 1,500 miles. 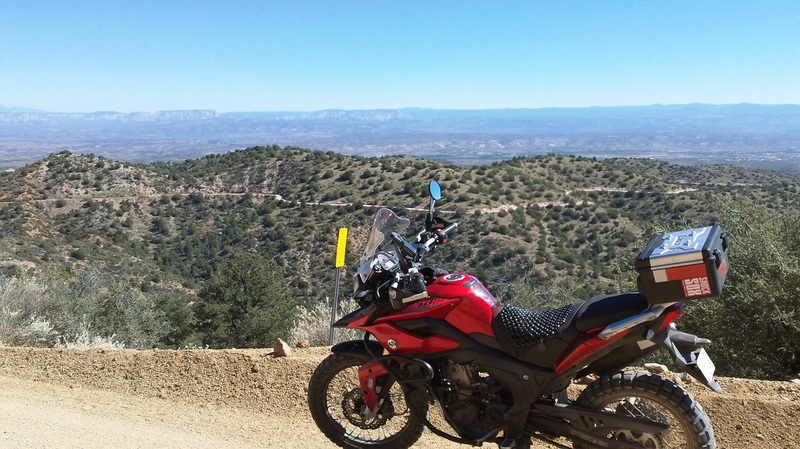 For the second time in two years, I ended an adventure riding down Schnebly Hill into Sedona. I also learned first-hand the limitations of large adventure bikes. 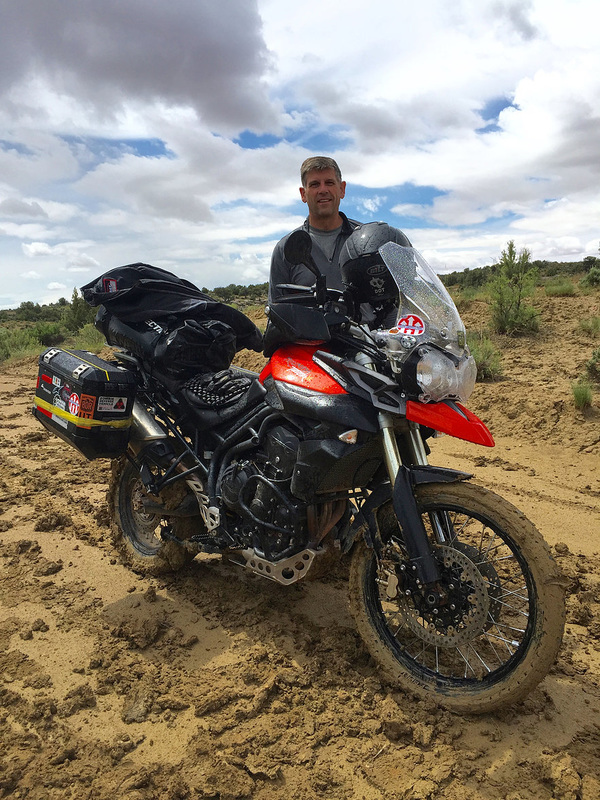 An inch of Utah mud can stop you indefinitely (and break off a $250 front fender!) Not only do failures cost money in repairs, but can actually be dangerous if you get stranded for hours or days in the back country. So I became disillusioned with the Triumph and spent the rest of the trip considering what my next bike would be. eventually came to the same conclusion many, many riders have already learned: there is NO perfect ADV bike. There is NO bike that excels in all conditions. 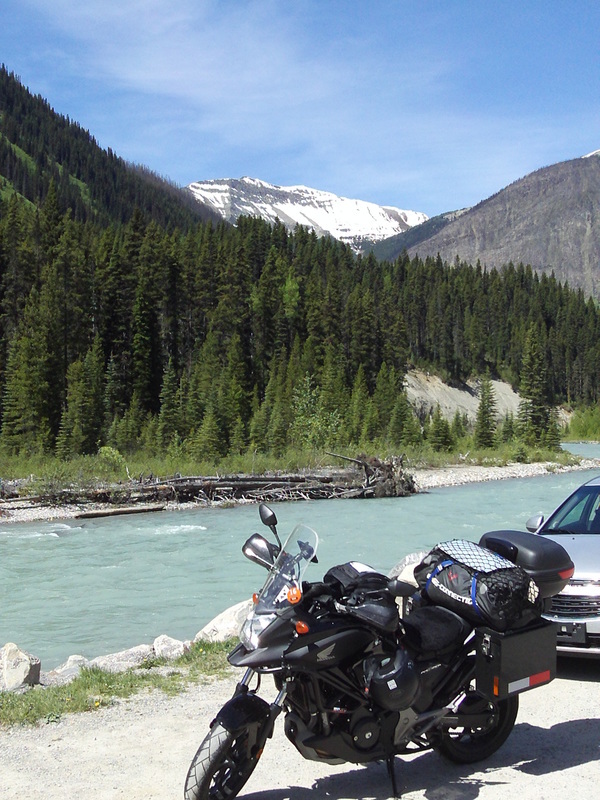 You can choose a large bike like my Tiger or Bob’s GS BMW for comfort on the highway and struggle in the rough stuff. Or you can choose a street-legal dirt bike like the WR250R for better off-road performance and punish yourself over long distances. Or you can admit defeat and buy more than one bike!!! So it was with this mindset that I started to plan for my next adventure: a road trip to Alaska! I studied the maps. I watched every available video. I read ride reports and books on motorcycling to Alaska. Then I planned my route. 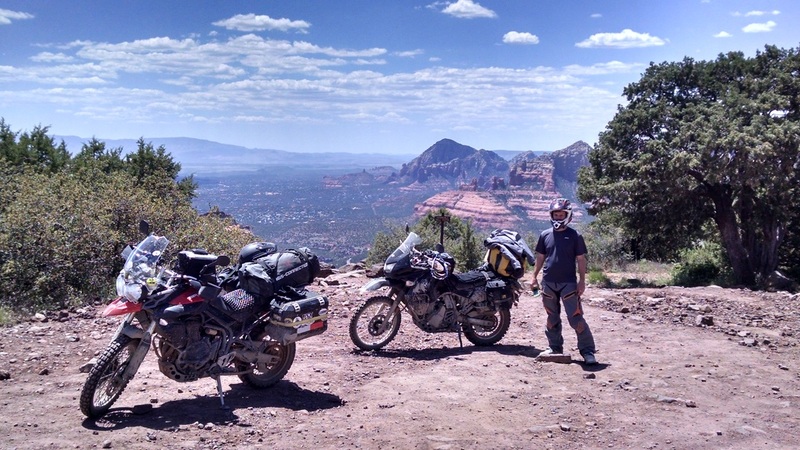 The trip would include over 6,000 miles of highway riding and over 1,000 miles of unpaved roads. Note that NONE of the miles would be technically difficult “off-road” trails. All this data was factored to select the replacement for the Triumph Tiger. 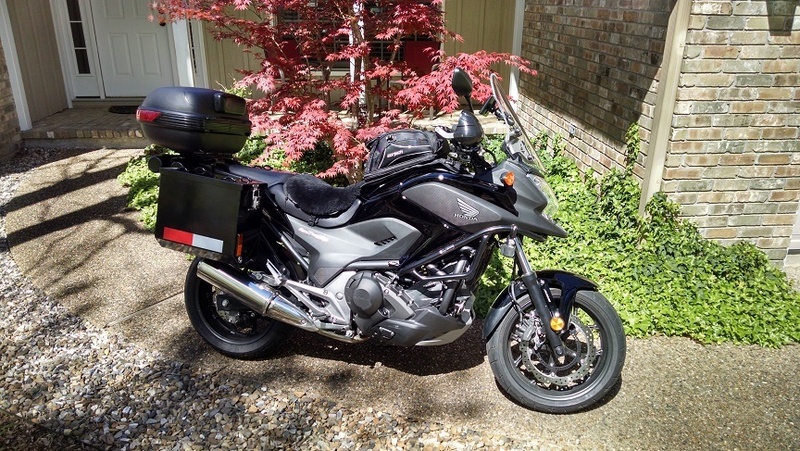 I needed a bike with great comfort for long days of 500 miles or more on the highway. I needed supreme dependability and the best possible fuel economy. I needed enough power to keep up with traffic on freeways while hauling my camping gear. But I also wanted the lightest possible bike that combined all these features and was still capable of wearing knobby tires for the 1,000 miles of unpaved roads. (I also wanted tubeless tires for ease of flat repairs on and off road versus the tube tires on the Triumph.) My choice was unconventional: The Honda NC700XD. On the way to Eagle, Alaska and then on to Dawson City, Yukon. My Alaska adventure was a complete success! Over 7,200 miles including over 1,000 miles on unpaved roads (after swapping the stock tires for knobbies in Fairbanks) to Coldfoot, Manley Hot Springs, McCarthy, Chicken, Eagle, and Dawson City! The Honda NC700XD proved to be perfectly reliable, comfortable and capable. Immediately after returning home, our house sold and we prepared to move to Arizona. The Honda would be perfect for exploring the great twisty mountain highways near my new home, including 2-up riding. 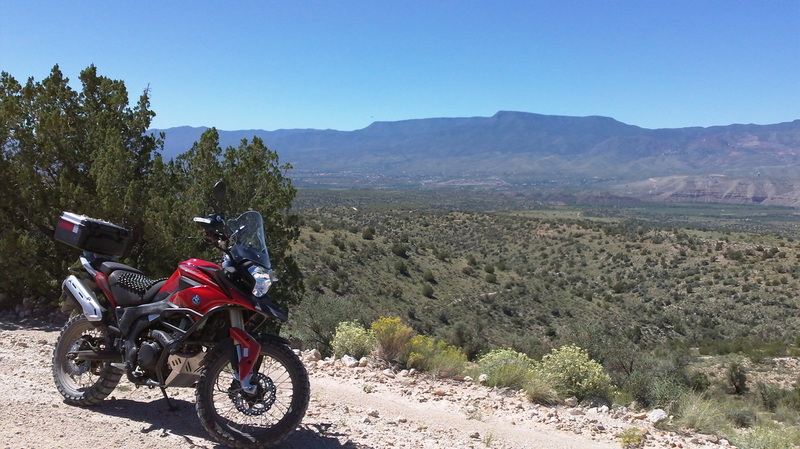 But I also was convinced that my Honda was not going to be the right ADV bike for off road exploring. I NEEDED a second, lighter motorcycle. And this brings us to the RX3 Cyclone, imported by CSC Motorcycles. I had been watching the RX3 for over two years. 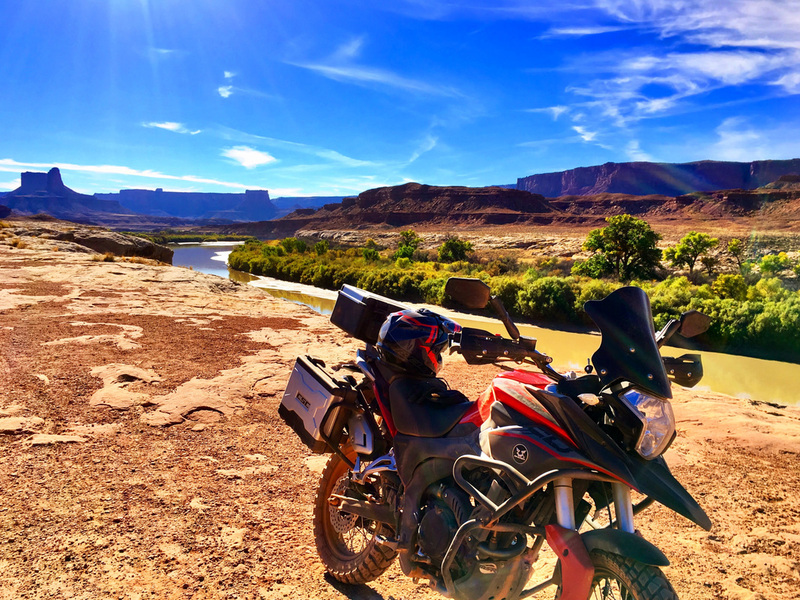 Remember that I had just completed over 2,000 miles of adventure riding on my Yamaha WR250R across Arizona, and from Arkansas to Utah and Colorado. To prepare for these rides, I had invested over $2,000 in modifications and upgrades to the Yamaha – which was already the most expensive motorcycle in the 250cc dual-sport class. Even after these modifications, the Yamaha was still too tall and too uncomfortable for serious adventure travel. (I know, this is my opinion. Other riders have ridden to the ends of the Earth on WR250R’s. They must be tougher than I am…) So I sold it – at a loss. Based on my experience, I already knew that a 250cc motorcycle was perfect for adventure riding. There is no problem maintaining highway speeds on a 250 – which may come as a shock to the owners of 1,000 and 1,200cc “adventure” bikes. In fact, a 250cc motorcycle is considered HUGE in most of the world where 100 or 125cc motorcycles are the norm! In addition, CSC stands behind this imported cycle with a 2-year parts and 1-year labor warranty! The RX3 Cyclone as specified by CSC Motorcycles is also an unmatched package of components and accessories. The standard RX3 includes the base features that had previously sold me on the Yamaha WR250R including fuel-injection, 6-speed transmission and liquid cooling. I consider these three features to be non-negotiable for a modern adventure bike. These three requirements eliminate other traditional choices like the Honda XR650L, Suzuki DR650 and DRZ400S, Yamaha XT250 and the Kawasaki KLR650 - even though there are thousands of satisfied riders around the world for each. 4.2-gallon fuel tank. This last feature alone was probably the deciding factor. It costs hundreds of dollars to outfit other bikes with a gas tank capable of a 200-mile range. Why do manufacturers supply “dual-sport” bikes with 2-gallon gas tanks? This is just inexcusable for any motorcycle intended for anything more than short trips to the mall! Digital speedometer and analog tachometer. In conclusion, the RX3 is an adventure-ready package that costs HALF of what it costs to assemble a comparable motorcycle from any other manufacturer. I know – I have done it several times! Lower seat height, even after the upgraded “tall” seat from Seat Concepts. Plus, this seat is actually soft and wide! Available 19-inch front wheel for added ground clearance and a wider selection of knobby tires. Optional 12-volt accessory and USB outlets on the dash. Optional billet aluminum headlight guard, and guards for other components. Dozens of other parts and accessories available from CSC. Make no mistake! The RX3 Cyclone is NOT a motocross bike. It is NOT the bike for you if ALL you want to do is ride single-track, pop wheelies, and jump logs. 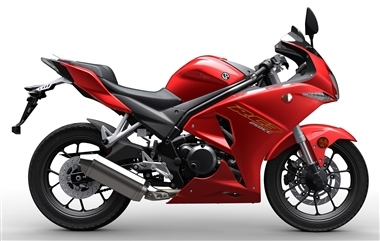 CSC offers the TT250 dual-sport bike for more punishment off road. 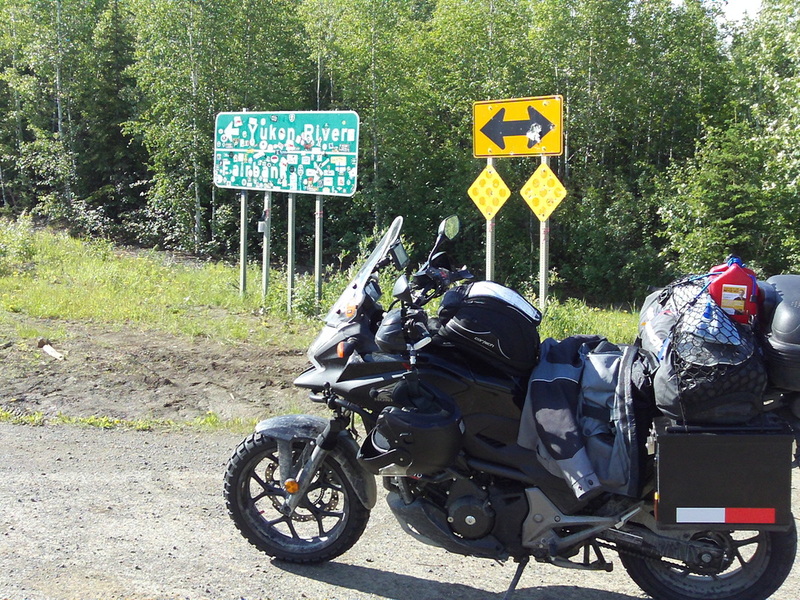 The RX3 is not the best possible bike for a 7,200-mile trip to Alaska and back in 15 days. I have a Honda NC700XD for that! But – the RX3 is the perfect economical and comfortable bike if you want to ride the highway to the dirt roads. It is perfect if your dual-sport riding includes gravel roads that do not require low range and differential locks in a Jeep! (Especially if you chose the optional 19-inch front wheel, knobby tires, 13-tooth front drive sprocket and skid plate like I did. Plus, the side racks and panniers can be removed for trail riding.) Of course, the RX3 will commute to work or school and take road trips without sacrificing comfort or performance like a REAL dual-sport! The RX3 Cyclone does everything I require of a dual-sport motorcycle. I now have a light and dependable bike that handles the twisty highways and turns readily onto the dirt roads. I can load it up for multi-day rides when needed. I can maintain and fix most everything myself on the simple thumper. Parts are free for the first two years, and then cheap to buy after that. And when the RX3 gets dirty or gets dropped I don’t cry over thousands lost in resale value. After all, I can buy FIVE RX3 Cyclones for the price of most “adventure” bikes and have just as much fun – maybe more fun and less stress and exertion! PS. If you never venture off the pavement, CSC also offers the same dependable and economical 250cc motor in a high-performance sport bike: the RC3. 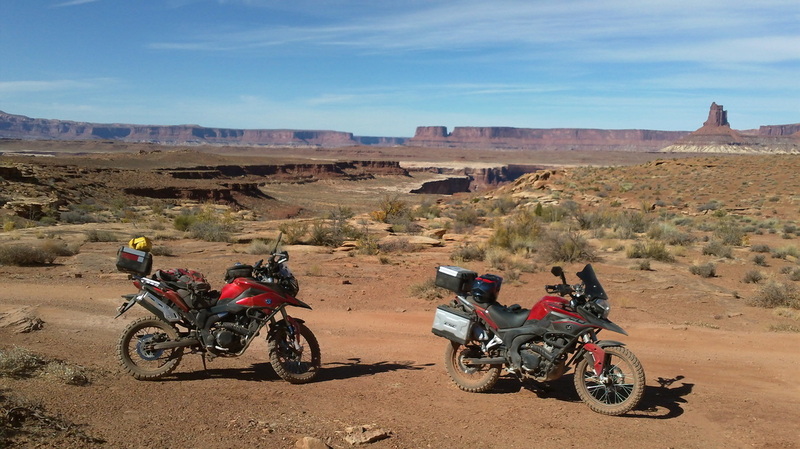 What to look for when buying an adventure motorcycle. “Adventure bikes” are the fastest growing segment of the motorcycle market. 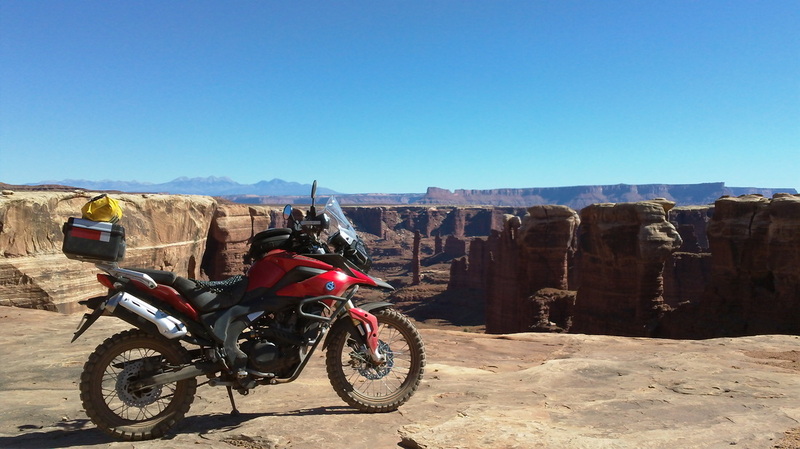 An adventure bike is defined as a motorcycle that can take you across the country, or around the world. It needs to be able to carry gear for a few days. It must handle both paved and unpaved roads. Let me give you some of my opinions. 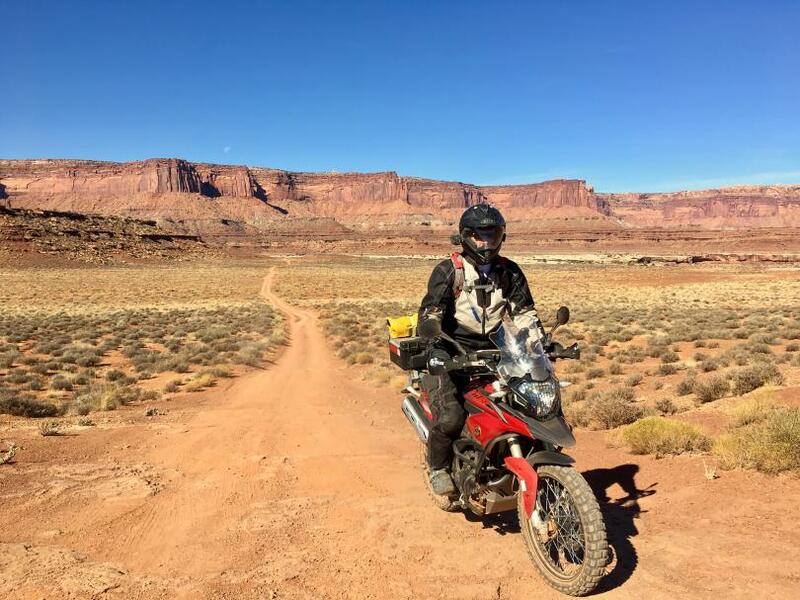 My requirements for the IDEAL adventure bike are based on many thousands of miles ridden on several drastically different adventure bikes on dirt roads and highways, as well as the Trans-America Trail, several “Backcountry Discovery Routes” and over 7,000 miles to Alaska. First, a real adventure bike needs to be comfortable on the highway and keep up with the traffic. By definition, an adventure bike is a motorcycle that you can pull out of the garage and head down the highway to your chosen trail. Then you can explore the countryside on the dirt roads beyond where street motorcycles turn around. After your dirt ride (an afternoon, a week, month, or more), you rejoin the pavement and mix it up with cars and trucks on the way back home. 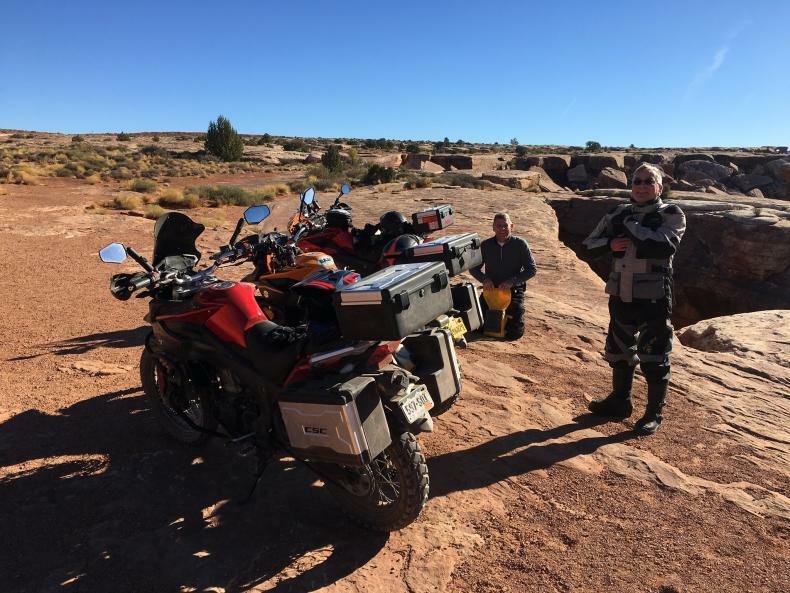 As an example of an adventure ride, three RX3 riders (rbrADV, GSC, and 3banger) recently left Moab, Utah for a ride on the White Rim Trail. We rode our bikes down the highway about 30 miles at 60 mph+ to the start of the unpaved section of the trail. 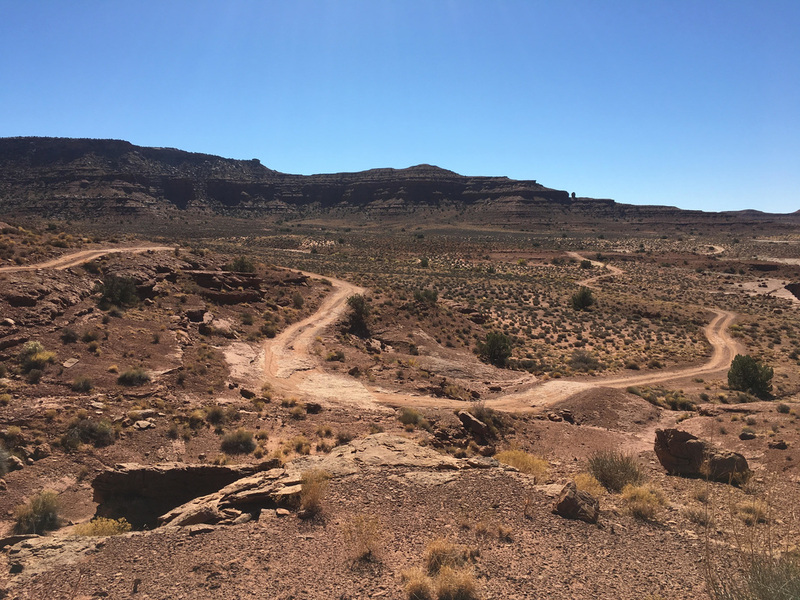 Because the RX3 has a powerful 250cc motor, liquid-cooling, and a 6-speed transmission it was no problem to maintain the speed limit and even pass slower vehicles on the highway while climbing the bluffs heading away from Moab. 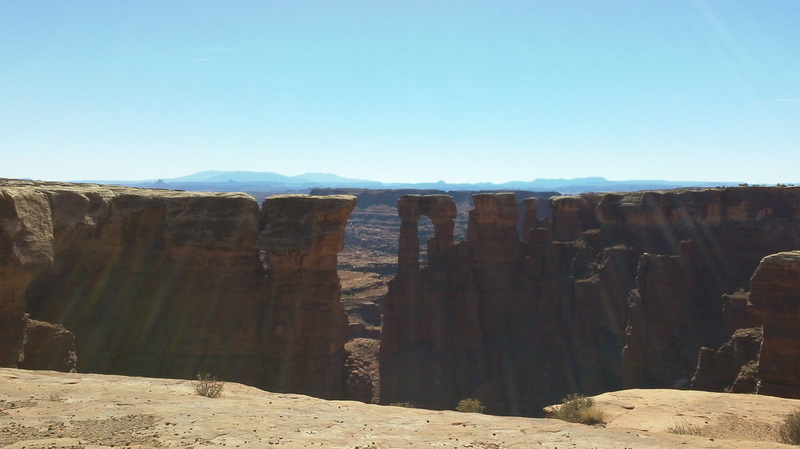 We then rode the demanding 90-mile White Rim Trail, and after hopped back on the highway for the return trip to Moab. To provide comfort at highway speeds, the RX3 comes equipped with both a great windshield and wide, rubber-topped foot pegs. The windshield minimizes rider fatigue and the foot pegs isolate engine vibration. Not to be overlooked, the RX3 also includes a wide, comfortable saddle. And, while it is a small bike compared to 1,000cc and 1,200cc behemoths, it has just enough weight to NOT get blown around by oncoming traffic. The bike is not cramped for tall riders, and it can be lower for shorter riders. I learned the importance of these features while riding across the western U.S. while following the route of the Trans-America Trail. I had outfitted a Yamaha WR250R (a street-legal dirt bike) for this extended dual-sport adventure. Even after adding a foam pad and a sheepskin cover, the seat was miserable for all day riding. When we hit the pavement sections of the route, oncoming semi-trucks nearly blew me off the road on the tall, light bike. I tried adding a windshield to cut down on wind buffeting, but it was only a moderate success – and an expensive after-market option for the dirt bike. I also replaced the stock tiny foot pegs on the Yamaha with larger pegs for another $100. All these modifications are unnecessary on the well-equipped RX3. Second, an adventure bike needs to seamlessly transition to unpaved roads. 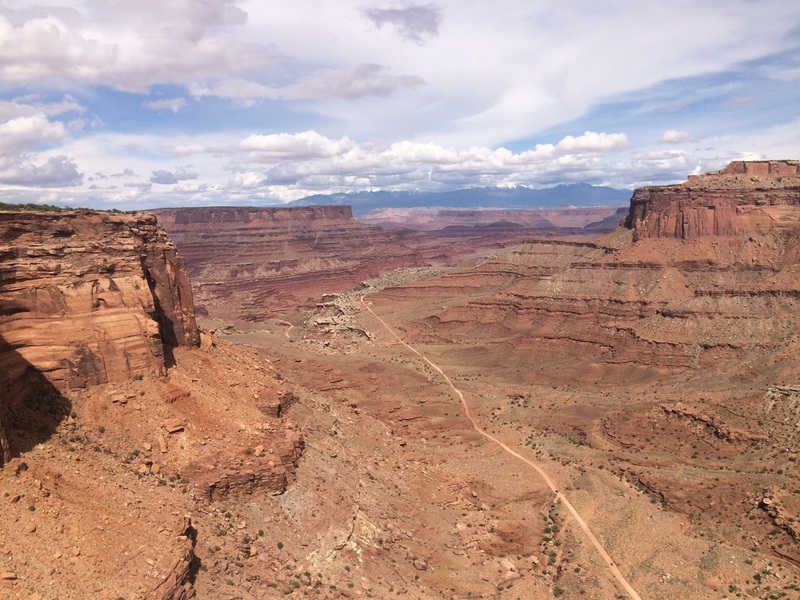 When we reached the end of the pavement in Canyonlands National Park and the start of the White Rim Trail, all we needed to do was reduce the pressure in our knobby tires on the RX3’s to provide more cushioning and better traction. Of course, this means that an adventure bike needs to accommodate knobby tires. The RX3 includes a popular option for a larger 19-inch front wheel. This size provides many options for knobby tires. Note that “adventure bikes” are not the same as motocross bikes. We are going to be riding unpaved ROADS – not dirt bike trails. For this reason, it is not necessary to have the standard 21-inch front wheel found on dirt bikes. In fact, the slightly smaller and wider 19-inch front wheel provides more stability on both paved and unpaved roads. The RX3 has simple and proven spoked wheels with steel rims. Tubeless tires on cast wheels are not repairable in the boonies. I used to own a DL650 Vee-Strom and when riding on extended trips I still carried a spare inner tube and bailing wire to repair damaged tubeless tires. Standard knobby tires with inner tubes are by far the most dependable at lower psi and easiest to repair. My RX3 at the start of the White Rim Trail. 19-inch front wheel shown. The RX3 includes the features required of a good adventure bike that is designed to be ridden off the pavement. Engine guards are included as standard equipment. I spent hundreds of dollars adding protective guards to my previous bikes. The RX3 has wide fenders spaced properly above the knobby tires. My expensive Triumph Tiger 800XC that I used to own had minimal spacing above the front tire. Even after adding more space - at additional cost - I still broke off the $250 front plastic fender in the sticky Utah mud when the tires clogged. The RX3 also includes a base steel skid plate, with a larger and more protective aluminum skid plate available as an option – shown above. This is a different set of requirements than a rider who is looking for a “dual sport bike”. If you want a motorcycle that you can take on short trips AND race single track and do hill climbs you are not going to want a CSC RX3. If you want a street-legal bike that can double as a woods bike for jumping logs you should consider the CSC TT250. 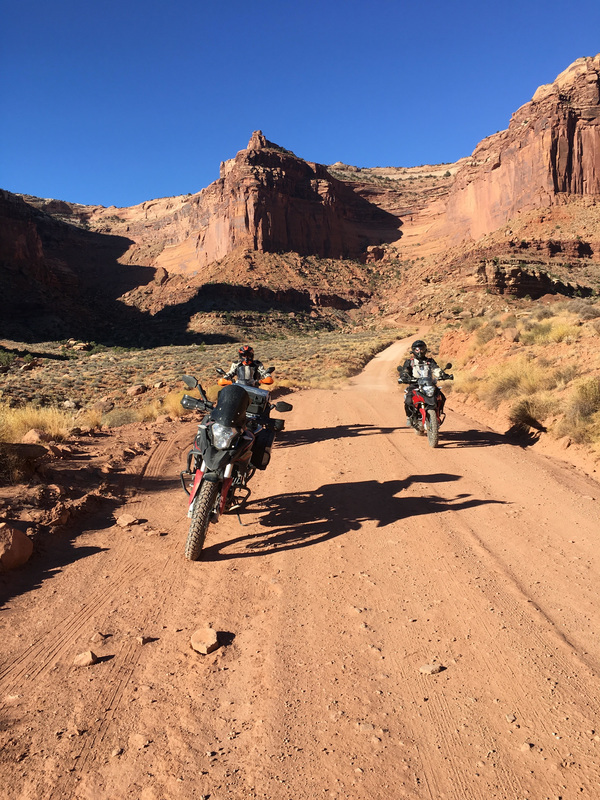 Most lightweight dirt bikes simply don’t meet the comfort requirements of a true adventure motorcycle designed for 100’s of miles in the saddle. Third, a great adventure bike should be designed for multi-day extended travel. Every other “adventure bike” that I have owned required hundreds, even thousands of dollars to outfit for long distance, self-sufficient travel. My single biggest complaint related to dirt bikes converted into dual sport bikes is the cost to add a larger gas tank. It should be obvious that when a motorcycle is equipped with a gas tank of TWO gallons (or less) that it was never designed for extended touring. Many dirt bikes have been converted to “adventure bikes” with a new gas tank, typically costing $400 or $500. You sacrifice the original tank for a plastic accessory tank. Your gas gauge (if you had one) no longer works and you never know how much fuel you have – unless you choose the ugly translucent plastic version. In contrast, the RX3 Adventure comes equipped with a 4.2-gallon steel gas tank with a locking gas cap AND a fuel gauge on the dash! 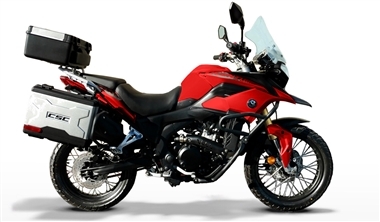 This is just right for an adventure bike, providing well over a 200-mile range between refills. The right-sized gas tank on the RX3 also means we don’t need to buy extra gas cans and mounting brackets, nor add extra weight to the bikes when refills are spaced within 200-miles. 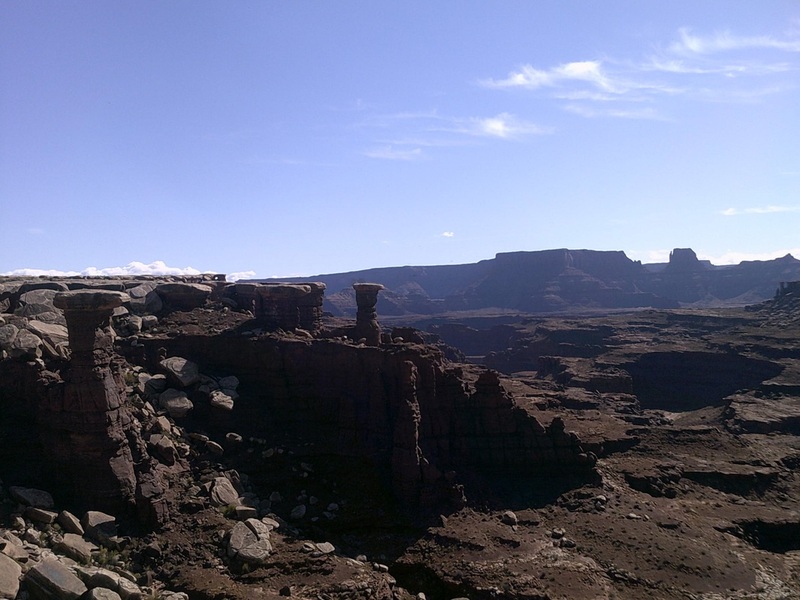 There are NO gas stops on the White Rim Trail. We made the 150-mile loop on a little more than half a tank of fuel. We did not need to add weight by carrying extra gas. 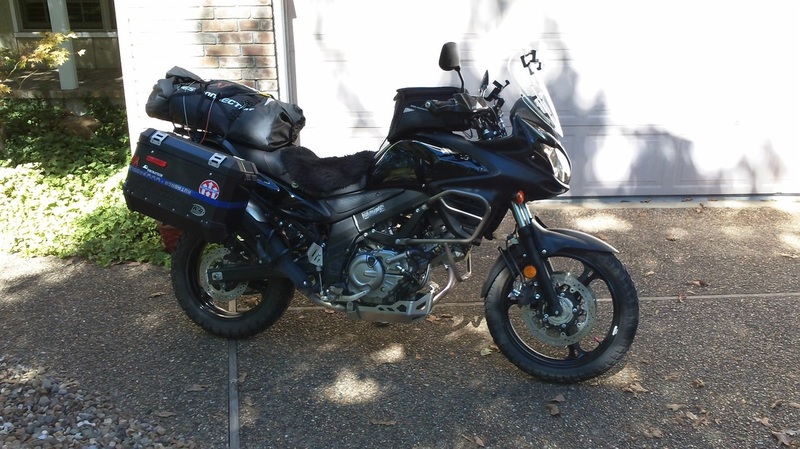 Virtually all “dual sport” motorcycles also require that you spend lots of money adding racks and luggage. You can’t add a rear top case until you first buy the accessory rear rack. Before you can mount your expensive side cases, you need to spend several hundred more dollars to buy the supporting side rack system. There are multiple suppliers who have built profitable businesses just selling the necessary hardware to properly outfit your “adventure bike” – over and above the cost of the motorcycle, not including hours of installation labor! Once again, the CSC RX3 Adventure comes equipped – as standard equipment – with a rear rack and top case and side racks and side cases. This luggage is designed for the motorcycle, and is not added on. In fact, the three cases even use the ignition key to lock! You could literally spend over $1,000 to outfit any other motorcycle with comparable luggage and racks. Note: the standard cases on the RX3 are not large. Larger cases are available as an option from CSC. But I see most adventurers carrying WAY too much stuff. I would recommend trying to carry everything you REALLY need in the standard cases provided PLUS a small duffel bag across the passenger seat. You can also add loops for a second stuff sack on the lid of the top case, as I did. But overall you will find that smaller is better, especially when traveling light on the 250cc RX3. Note that I removed the side cases and racks on my RX3, on the left above. 3banger’s bike is shown with the standard side cases, on the right. Finally, an adventure bike needs to be light, simple and dependable. You want a bike that you can pick up by yourself! You want a bike that you can manage if no one else is around, or if your riding partners are around the bend or over the next hill. The CSC RX3 is not a featherweight at 385 pounds, but that also includes all the equipment that would need to be added to other bikes that start out weighing less. You also don’t really NEED three different traction modes, four shift patterns and multiple braking options to enjoy an adventure. Keep it simple and ride! Besides, no dealer is going to have the part in stock when these finicky components fail so you are setting yourself up for delays and frustration. The RX3 has a dependable Delphi fuel-injection system and electronic ignition. Beyond that, the simple 250cc single cylinder 4-stroke engine can be repaired by most shade-tree mechanics. In fact, parts are covered by the CSC warranty for 2 years and labor is covered for 1 year – and you can go anywhere for repairs since there are no restrictions due to designated dealers. 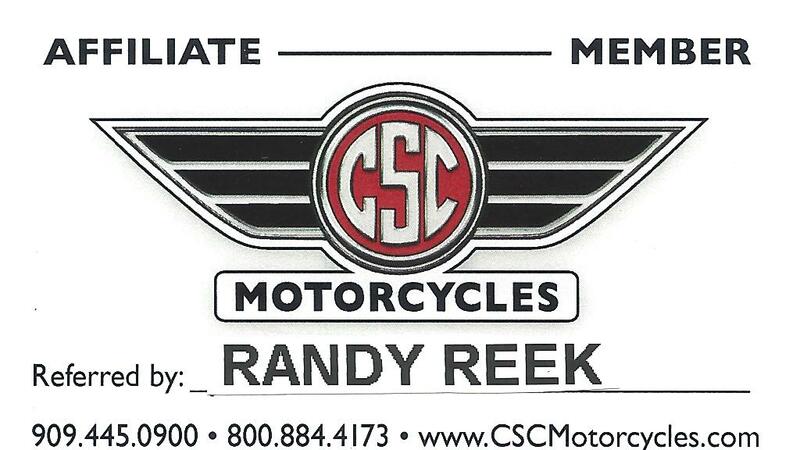 There are NO dealers – you deal directly with ONE company, the sole importer, CSC Motorcycles. The engine manufacturer, Zongshen, builds over 1 MILLION motorcycles per year, including private-labelling many well-known name brands. These motorcycles are sold worldwide, including hundreds of thousands in markets where the bike is the sole means of transportation and not just for recreation! Simple doesn’t mean that the RX3 Adventure is stripped down. It also includes features not found on many motorcycles at any price! The bike has a 300-watt alternator to accommodate electrical accessories. It also has two accessory switches already installed on the handlebars. There is an analog speedometer and a digital tachometer, a fuel gauge, trip meter, and temperature gauge on the dash. Accessory 12-volt and USB outlets are also available and are designed to be added to the dash, not tacked on. One more thing: an adventure bike needs to be FUN to ride! Many of us have more than one motorcycle. If you could have only one motorcycle, I can make a strong argument that you can’t go wrong with a CSC RX3 Adventure. But - if you have more than one bike - there is always one gets the most attention. This is the case with the CSC RX3 Adventure. It is just plain fun. Get on, rev it up, and simply ride it anywhere and everywhere. Three RX3’s on a 150-mile adventure! The RX3 Adventure is comfortable to ride for long distances. It is lightweight and maneuverable. It sits lower than dirt bikes so it instills confidence on sketchy surfaces. Compared to bigger adventure and street bikes, the RX3 feels “flickable” on the road and in the dirt. Of course, you can always make modifications and further customize your RX3 Adventure. For example, I removed the rear cases and racks for trail riding and lost over 30 pounds. I added a guard to protect the headlight from rocks. I am happy to report that both replacement parts and a wide selection of accessories are great values from CSC. You do not need to pay exorbitant prices elsewhere! Here is the bottom line: you can spend A LOT more for an adventure bike. But you are not going to have more fun, go farther, or create better memories of your adventures. In fact, at the low cost of ownership for an RX3 Adventure, you can start NOW and use the money you save to rack up more miles! The fun is riding. There are endless arguments as to what is the perfect bike for adventure riding, including the many options of planned routes like the Backcountry Discovery series and the Trans-America Trail. Having ridden these on other motorcycles, I would now choose the CSC RX3 Adventure. I would give up nothing over the bigger and more expensive bikes that I have ridden. I would gain comfort and capacity over the small bikes I have ridden. And I would have spent one-half to one-fourth as much to log the same exact miles! 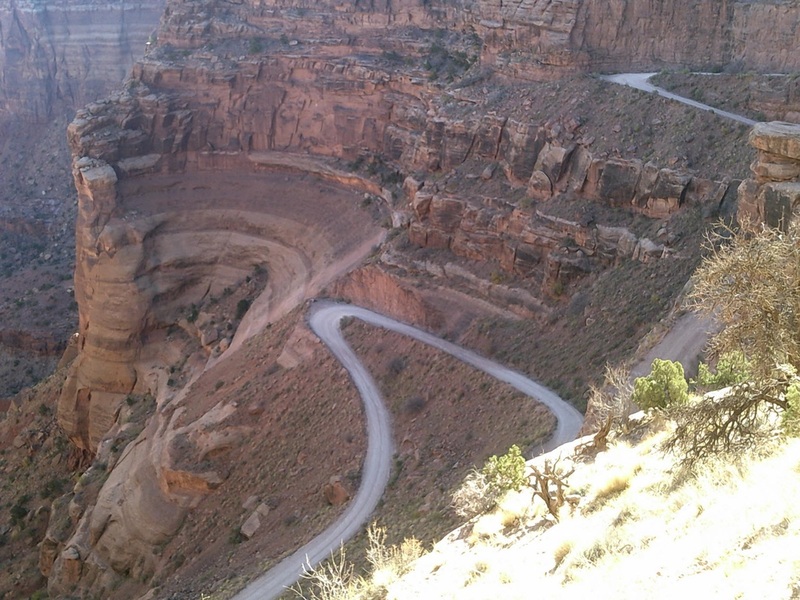 If we can ride the White Rim Trail, you can ride any of the BDR’s or the TAT on your own RX3 Adventure! 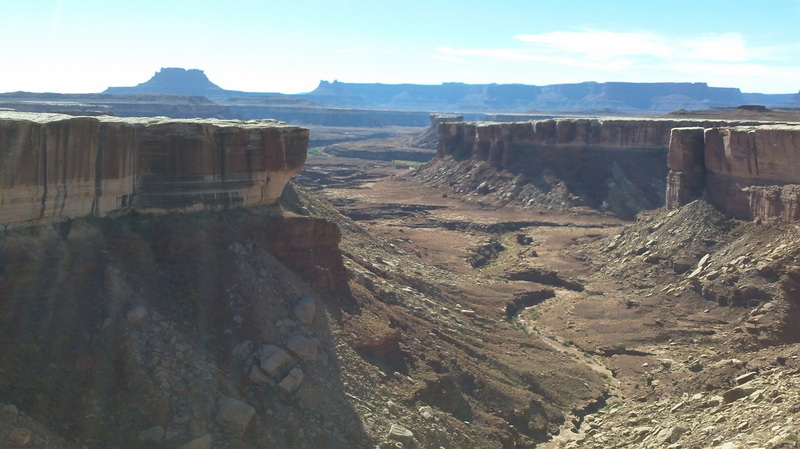 The completion of the White Rim Trail 60 miles on road and 90 miles of extreme back country adventure. We are always traveling. The Earth never stops turning! Come along and join me on the journey.